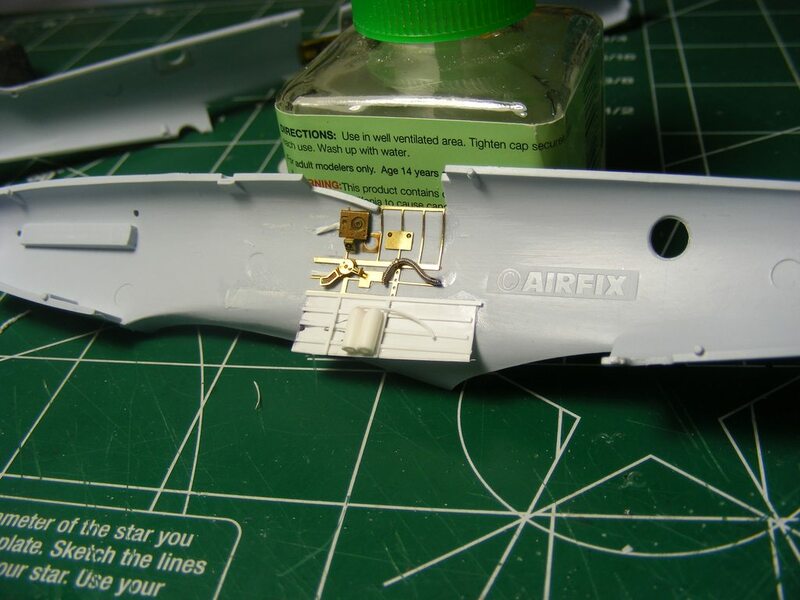 This is Airfix's Seafire being done as an FR47. 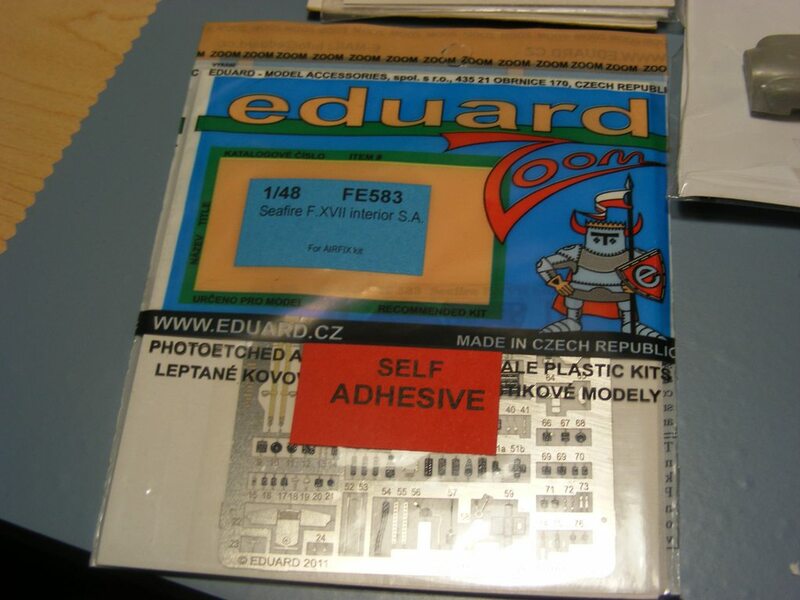 I have a few PE goodies to go along with it, as well as some resin and card stock. 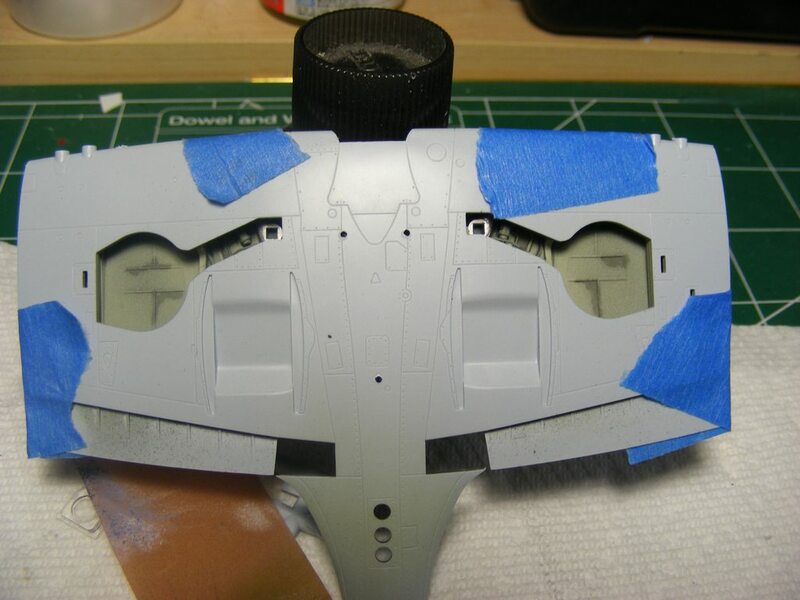 The colored etch may not be exact, but it is real close to most pics of I've seen of the FR47 cockpit. 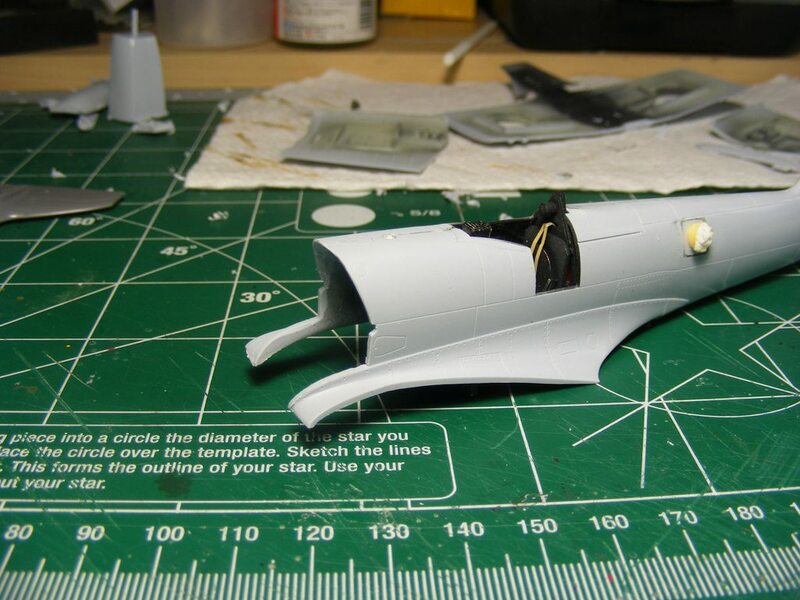 I actually have two kits, and this pic is the fuselage from the other one. I tried cutting out the top of the cowl for the resin replacement but botched it. 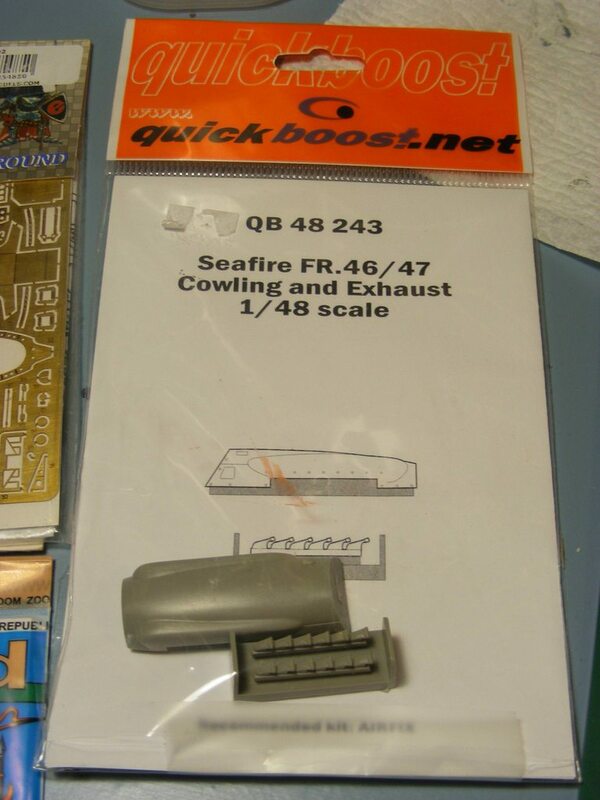 I have an engine set for the next one and the old fuse already cut will work for it now. 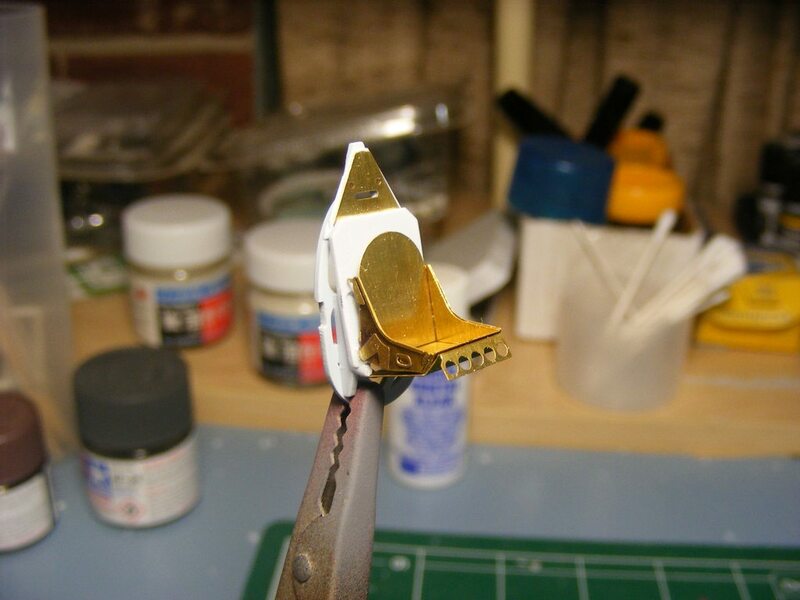 On this one, a little working cleaning up a seam is far less hassle. 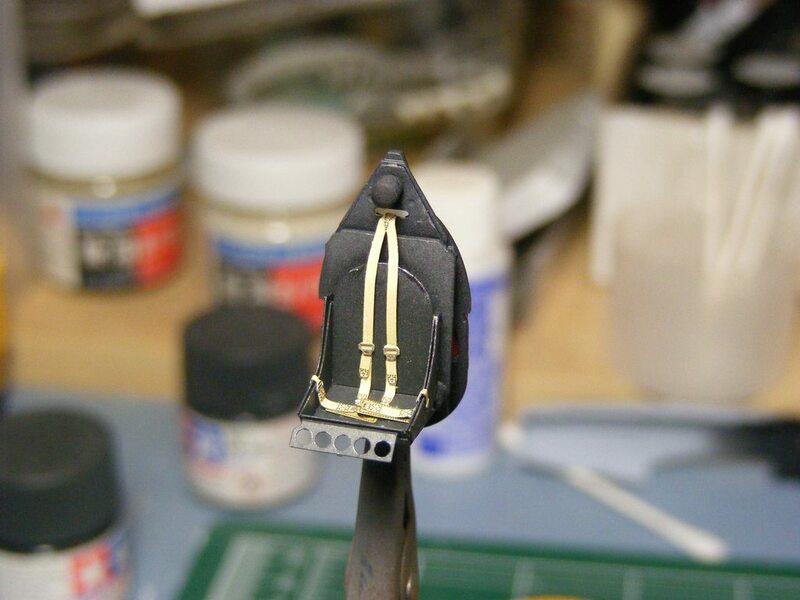 I will use the resin exhausts though! 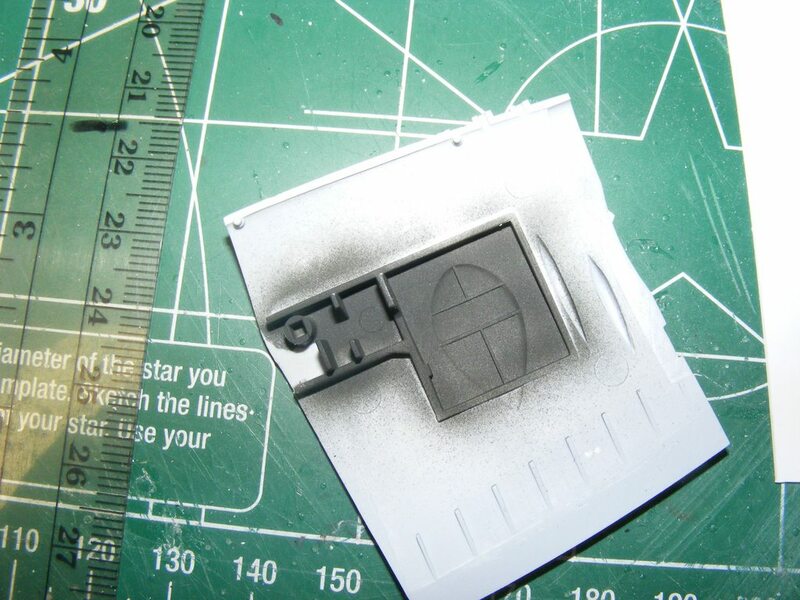 I also decided to just cut a hole in the side rather than try to cut a square to size with the clear kit part for that camera. 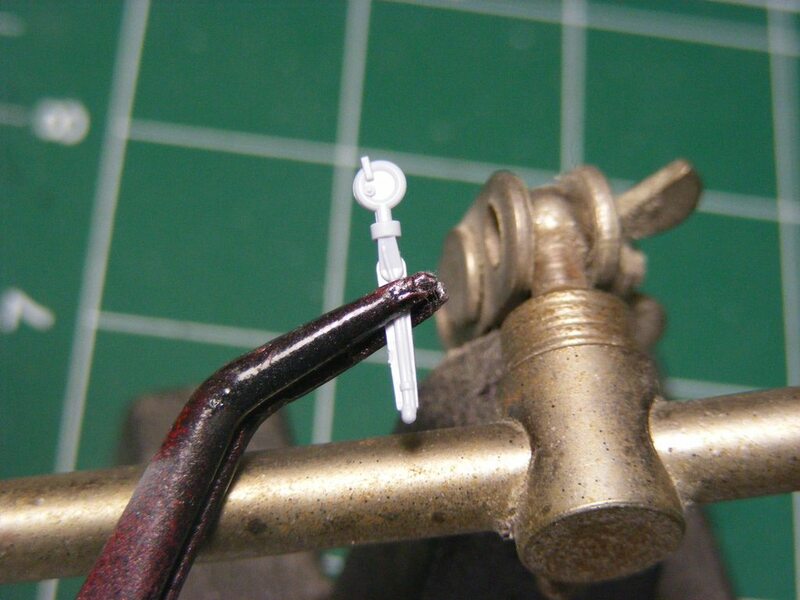 When all is done I'll use Micro Kristal Klear for the glass. 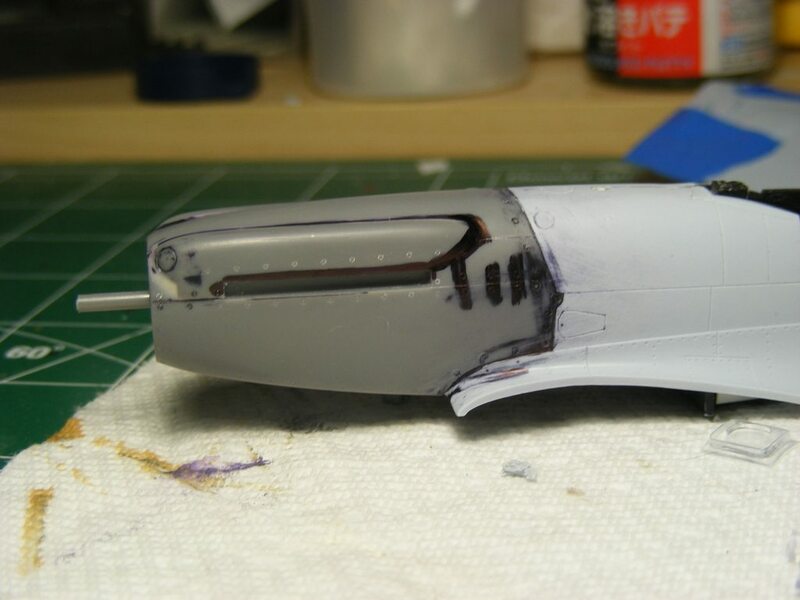 Then per the PE instructions, I sanded out all the interior side detail and laid down the metal. 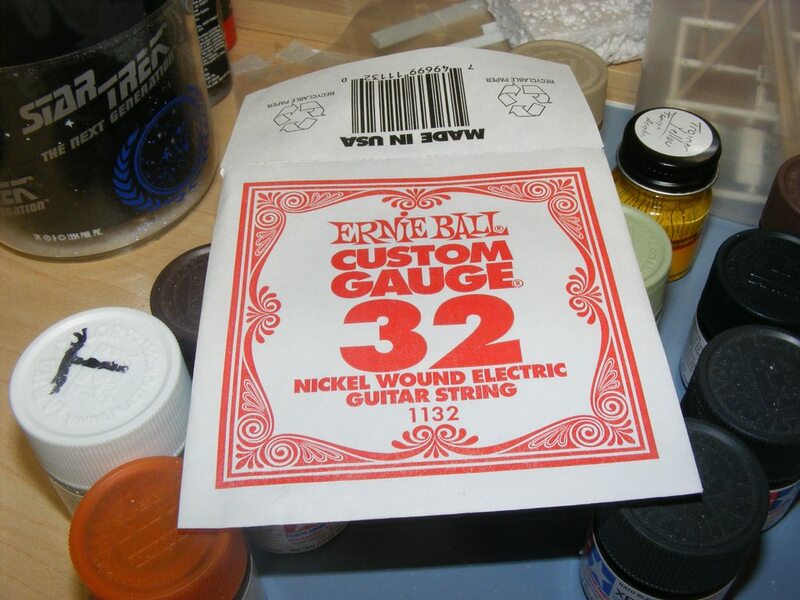 I'll be using a mix of the PE frets. 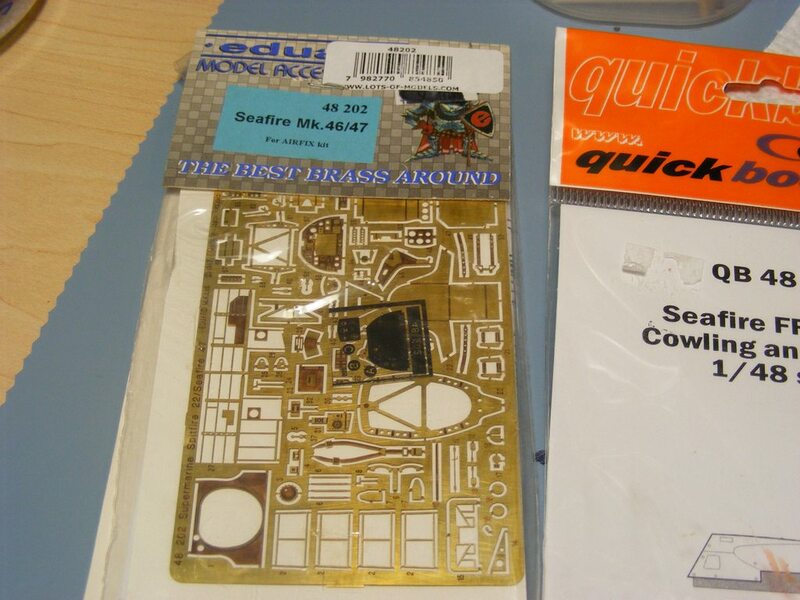 The pedals came next and then the seat, which is a mix of the PE and kit parts. 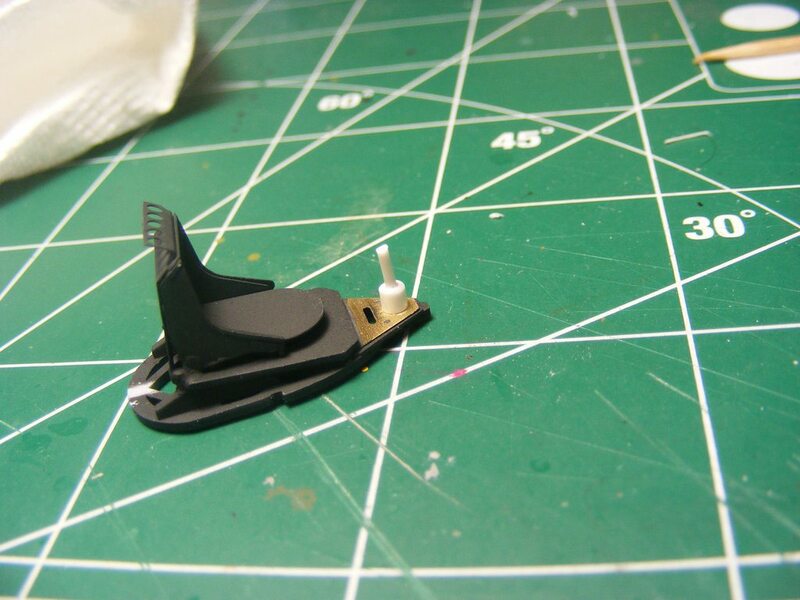 I also put together PE seat support but it is so fragile and I was concerned about securing it that I wont put it in. Then I decided that since I'm going to see the floor, I might as well rib it. 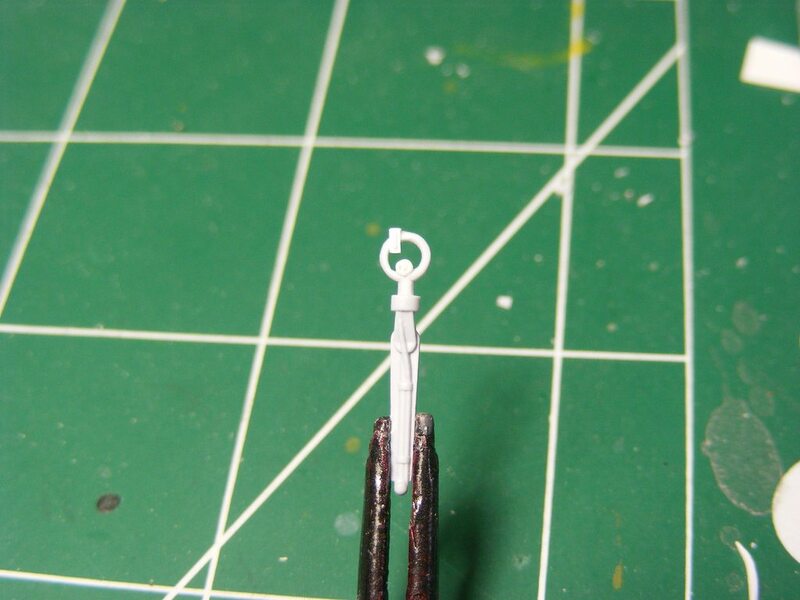 For the air hose on the starboard side I got out a bit of guitar string and bent it to shape with some small pliers. 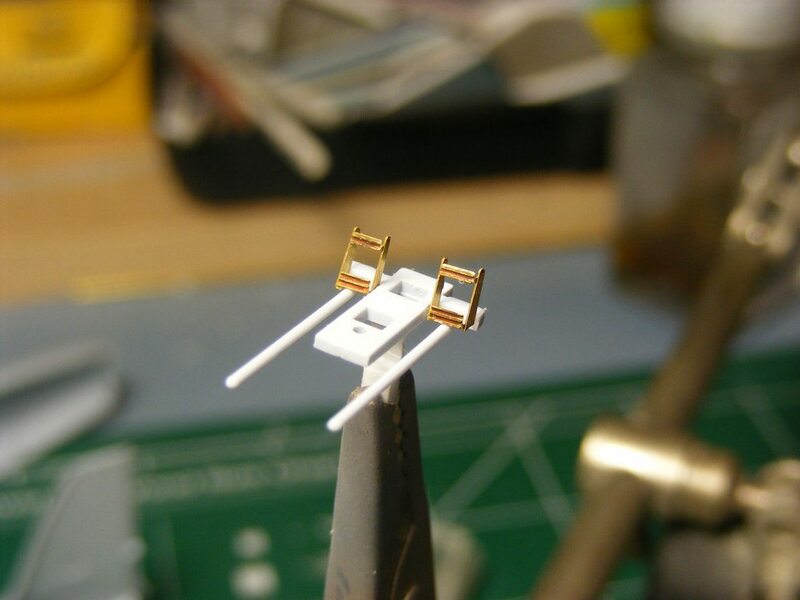 Then set it in place with a little scrap PE and CA. I don't know what this piece is, but I think it goes between the seat and the firewall. However. 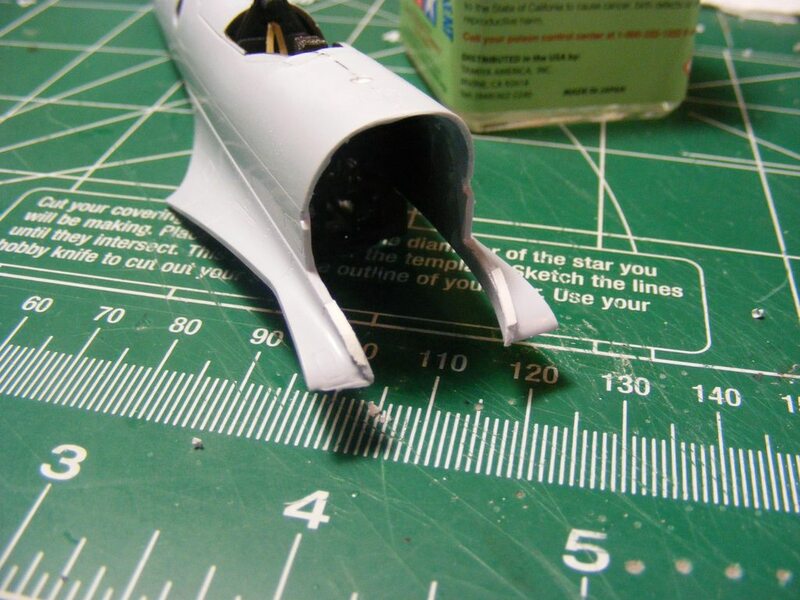 the gaps that were in it were bending out the plastic rods coming back from the pedals. I copied the shape in plastic and then put the PE over it. Then I decided to dummy up the bottoms of the walls with more plastic. Took a little trial and error. 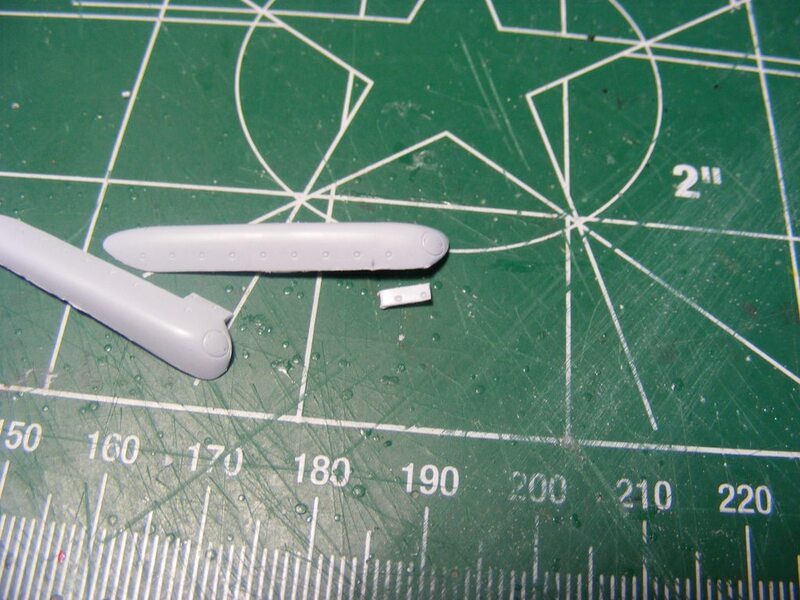 The plastic extended too far forward and would interfere with the IP so it was trimmed back and then ribbed. 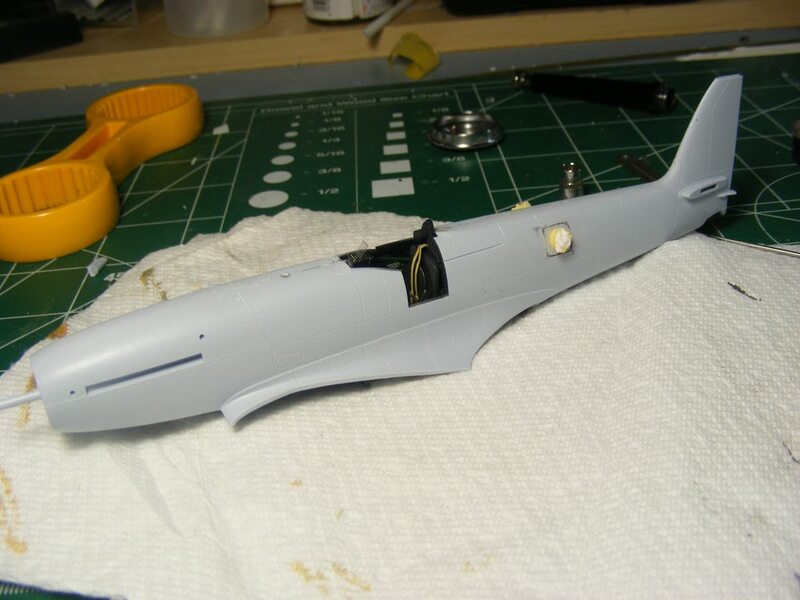 The same will be done on the port and then I may use some more scrap PE and plastic to busy it up. Last edited by Tiberious; 06-07-2018 at 03:05 PM. Zoiks! You dive right in T! 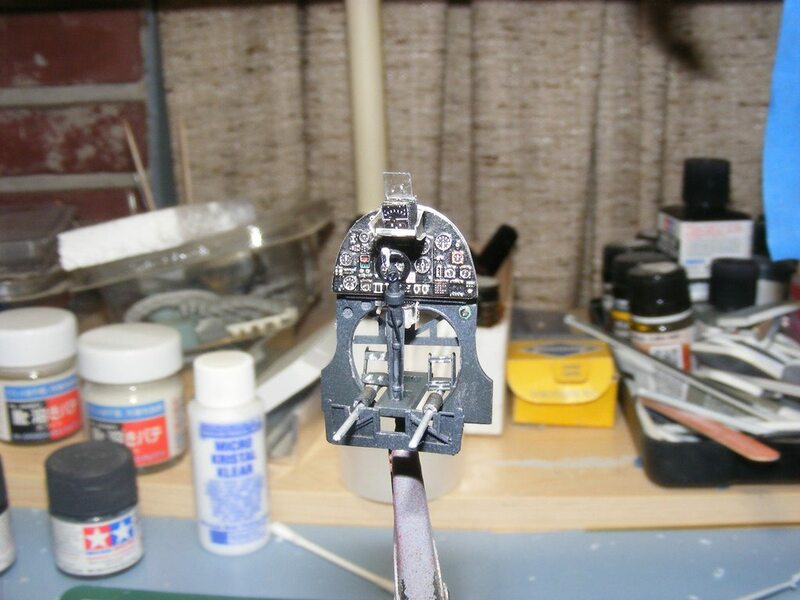 That cockpit is shaping up beautifully. 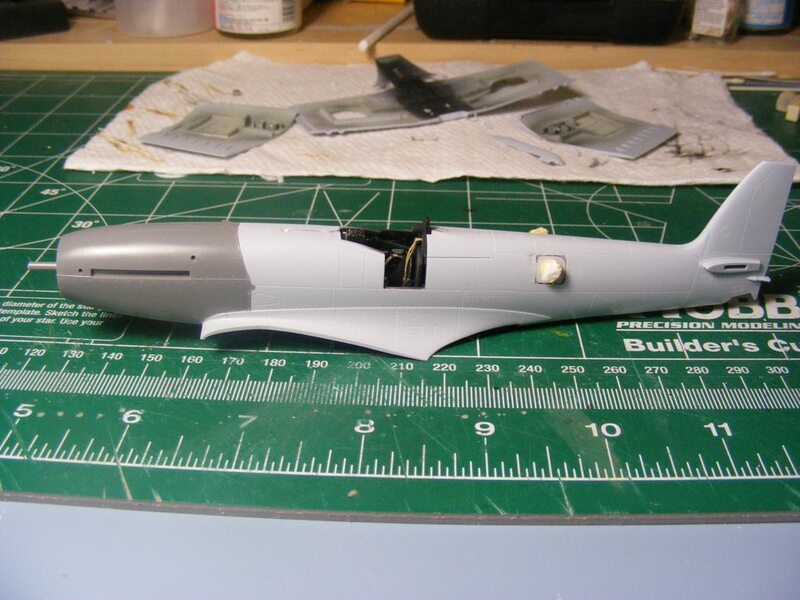 I've got a 1/48 float plane project starting up soon for the summer too. Can't wait to follow more of your build. Thanks a lot! 'm just hoping I don't mess it up! 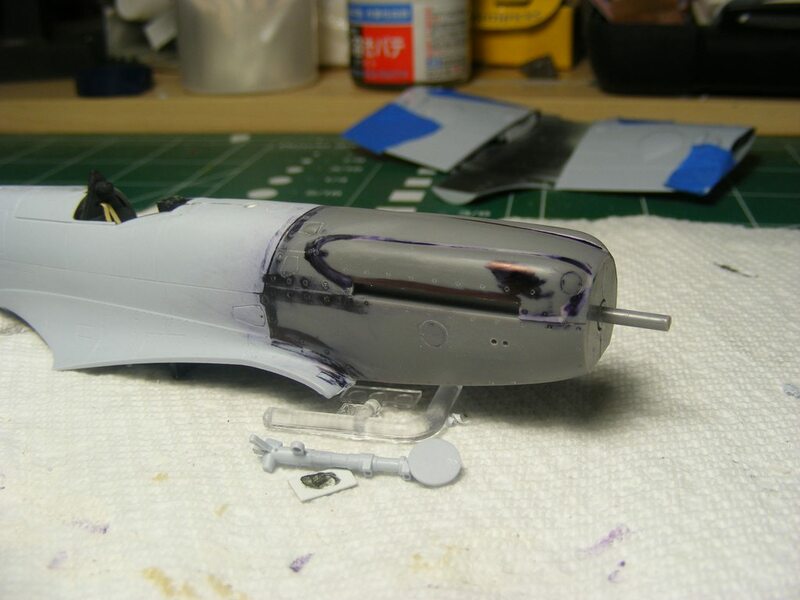 At the moment, the cockpit build is 'done,' in that it's going to paint next. 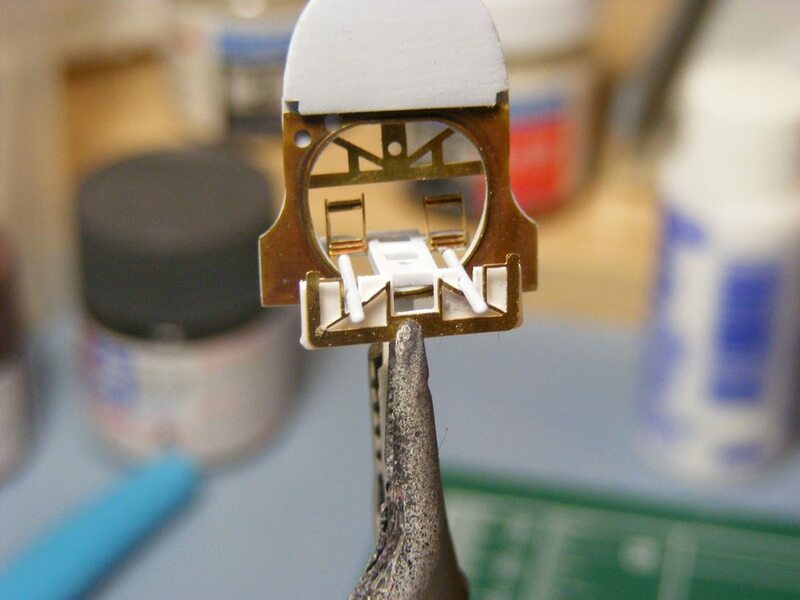 After that I will add the rest of the prepainted PE. 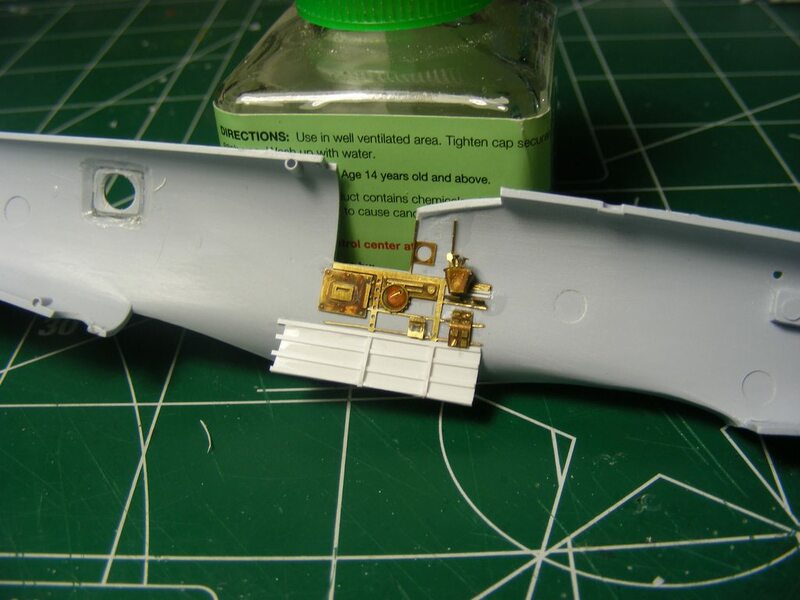 I also have some resin cameras coming from Ultracast for the fuselage, and I just hope they will be worth it when looking through the Klear. I redid some of the ribs on the floor to better match the ones on the sides. 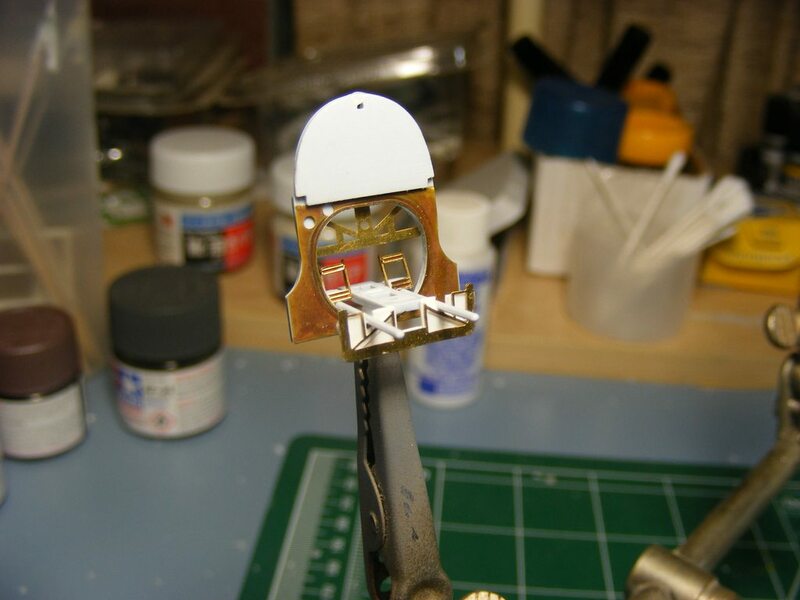 I also thought about adding some more detail, but I'm already starting to get some fitment issues, and not much will be seen of the lower areas after the seat is in place anyway. Now I'm just waiting for my next day off and some time to keep building! 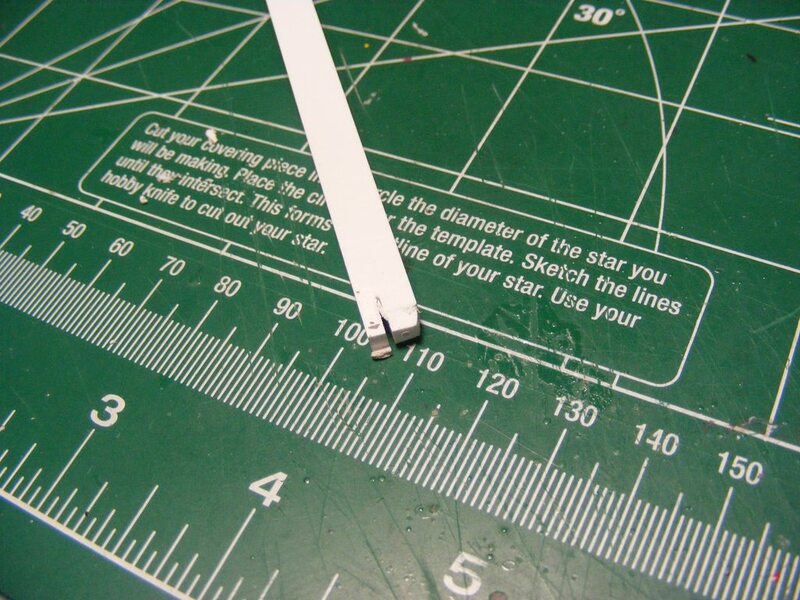 Are you using a specialized tool to fold and assemble your PE? No, no special tools. 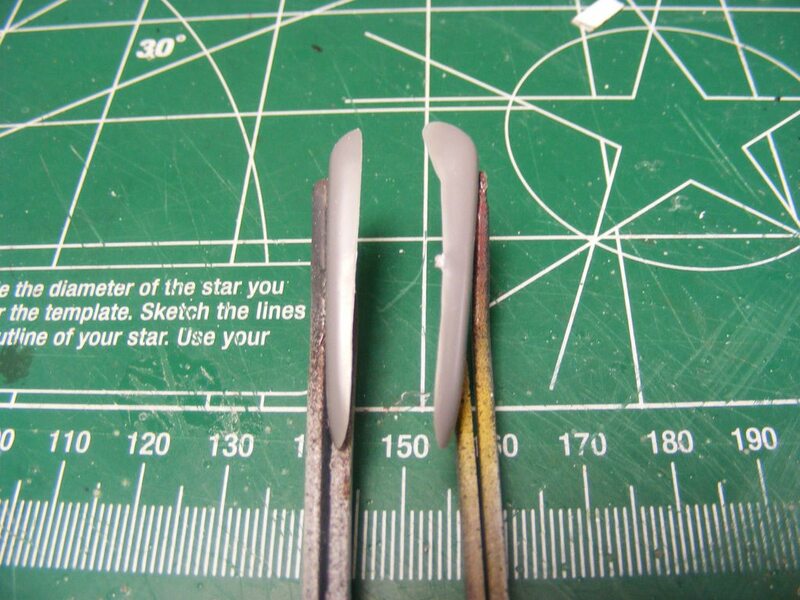 A pair of small flat-jawed pliers and the back edge of a hobby knife. They were all just simple folds, which helps out. 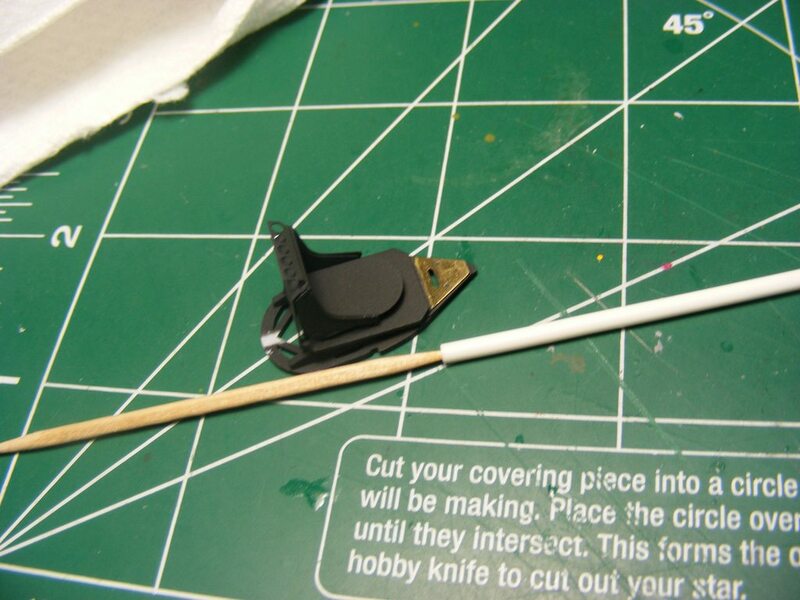 Decided I should do the control stick too rather than leave it out. 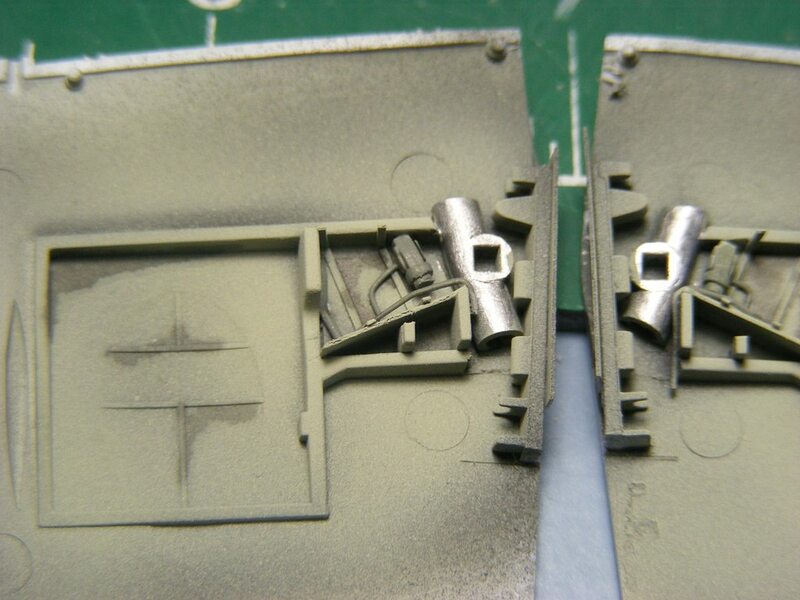 Of course once it was found on the sprue it revealed that a little work had to be done on it. 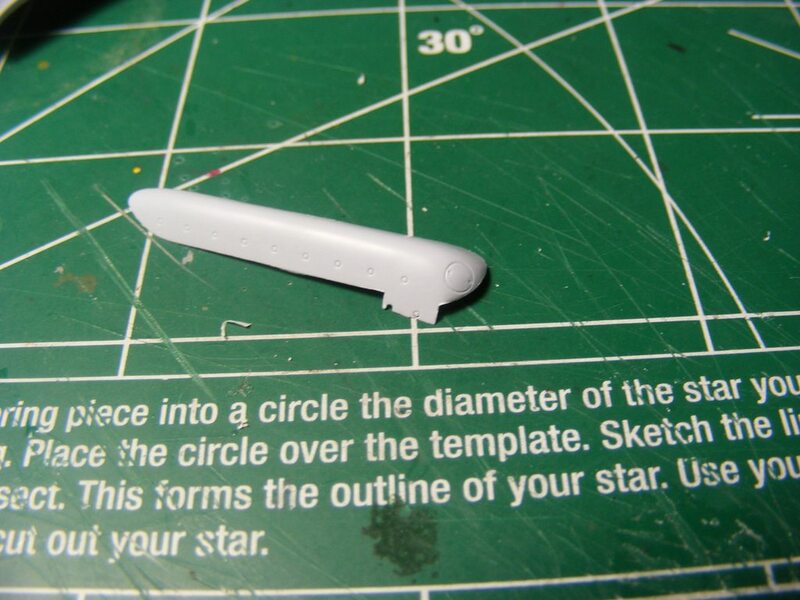 Airfix from '96 had it molded as a solid piece rather than an open circle. I broke out some drill bits and round sanding sticks and opened it up, then redid the triggers with misc plastic and round stock. 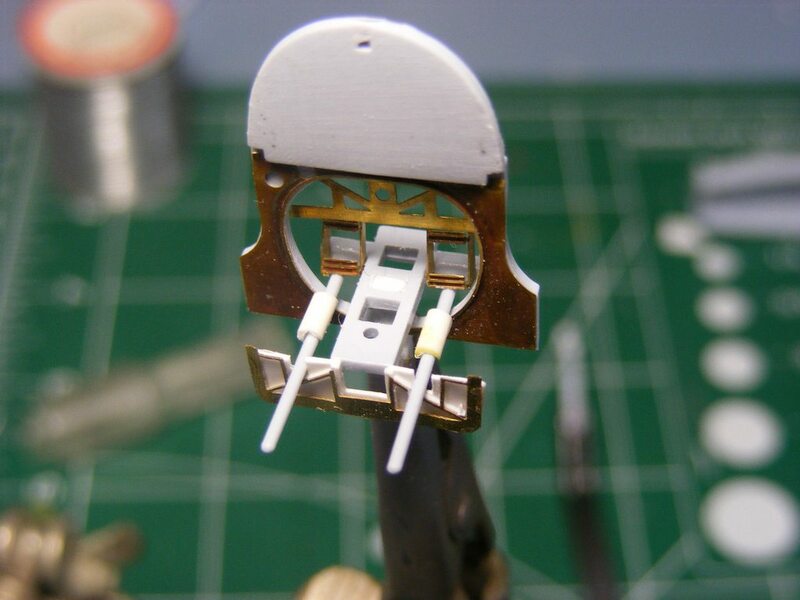 Also, looking at picks, there are some pistons that should be on the rods leading from the pedals. Unable to slip some on with them in place, I took a cutting wheel to a piece of round stock and cut a trench in the bottom. Then cut them to fit and slipped them over the top. From up high they should look alright. 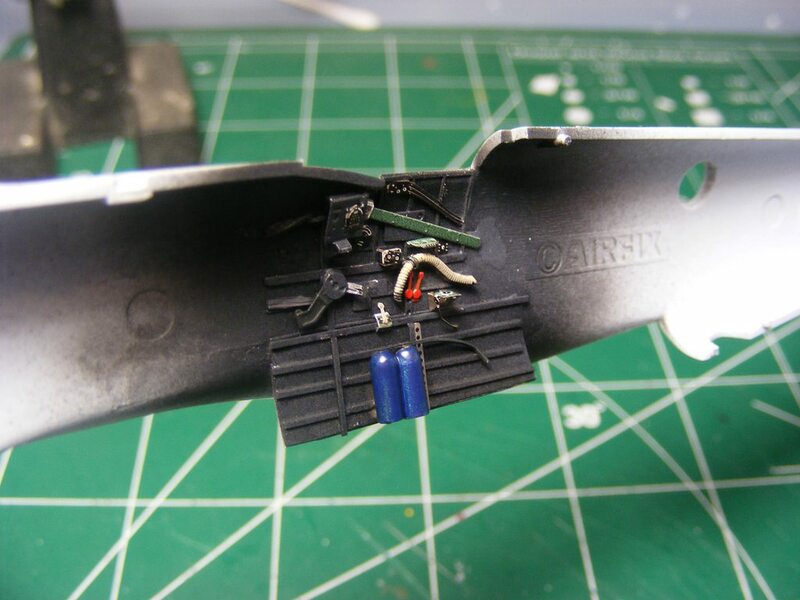 Then I threw some dark gray on the parts - and afterward promptly dropped the front wall, loosing one of the PE pedals in the process. It zinged off into the aether, never to be seen upon the mortal plain again. 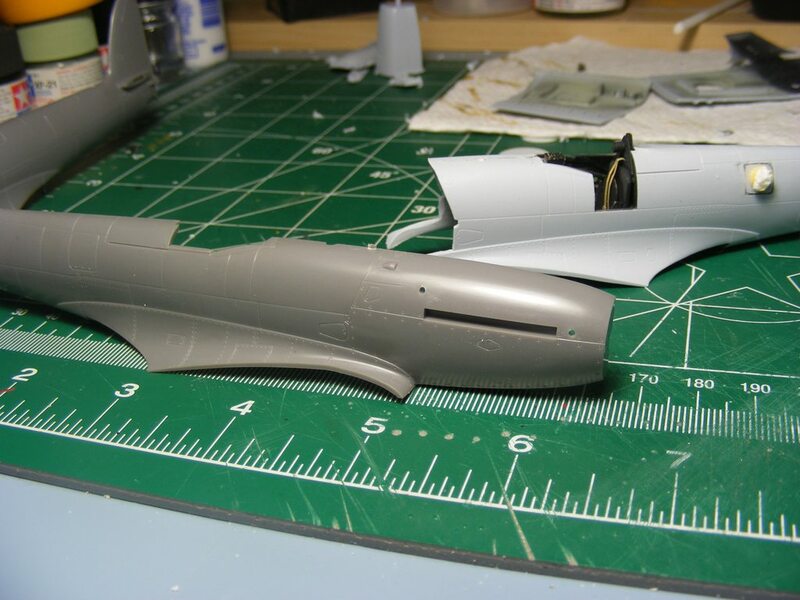 Or at least not until the fuselage is all glued together, in which case I'll find it in plain sight and unbent out of shape. Last edited by Tiberious; 06-12-2018 at 07:36 AM. Then I had to redo the headrest. 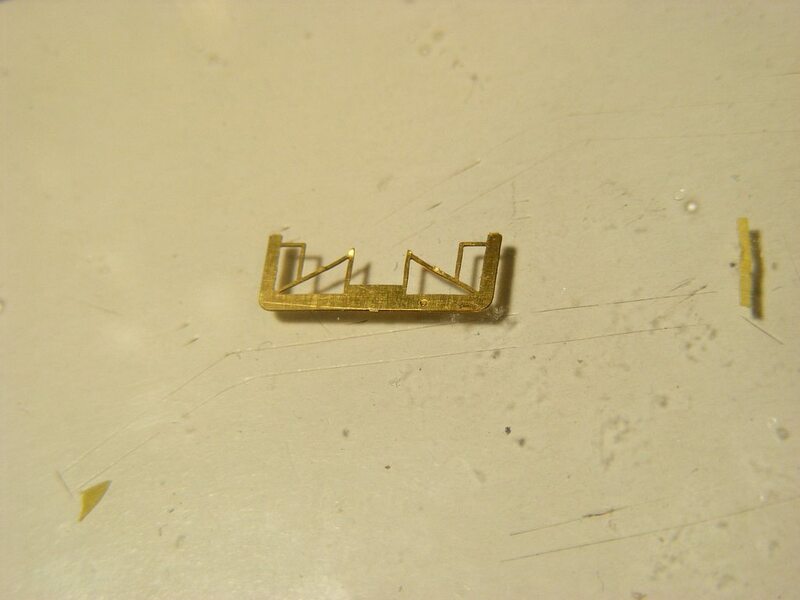 The PE part doesn't come with one so I had to fab one out of round stock. 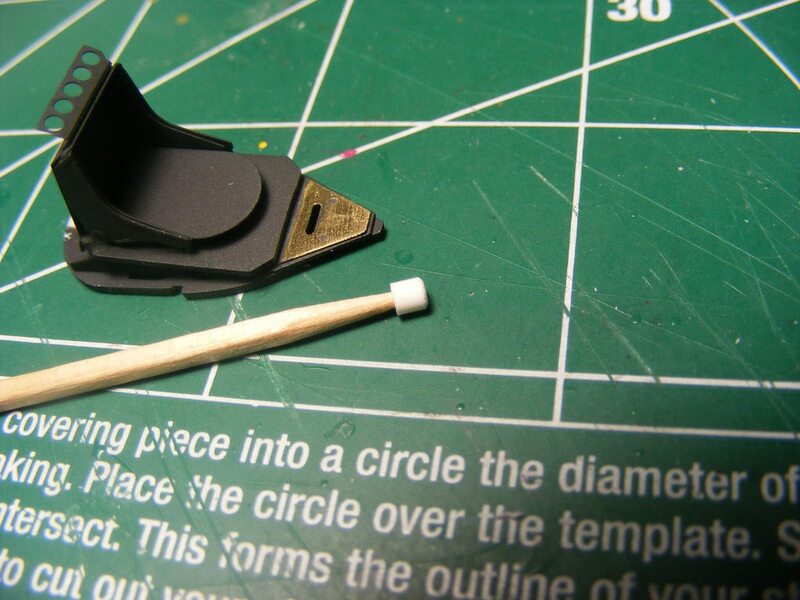 It was shaped alright, but there was too much glue leakage around the base, so off it came. 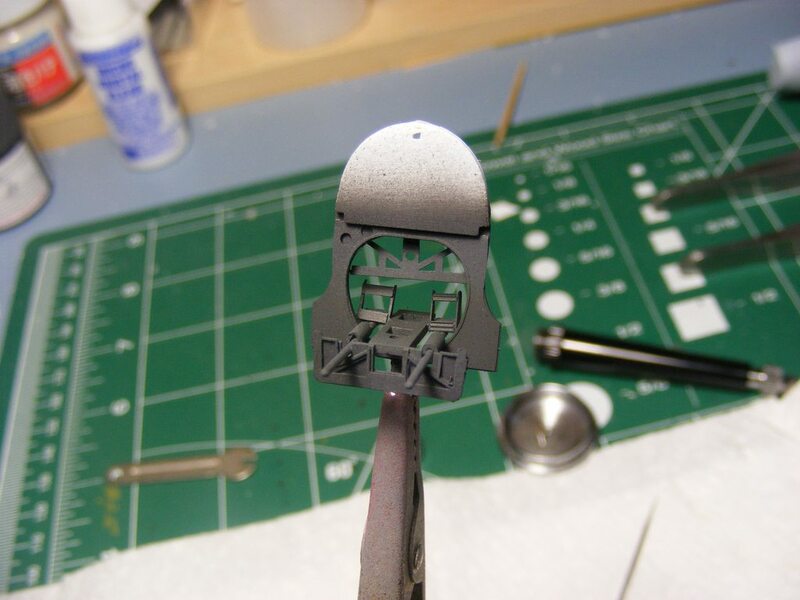 The PE was sanded back to metal and a new piece formed. 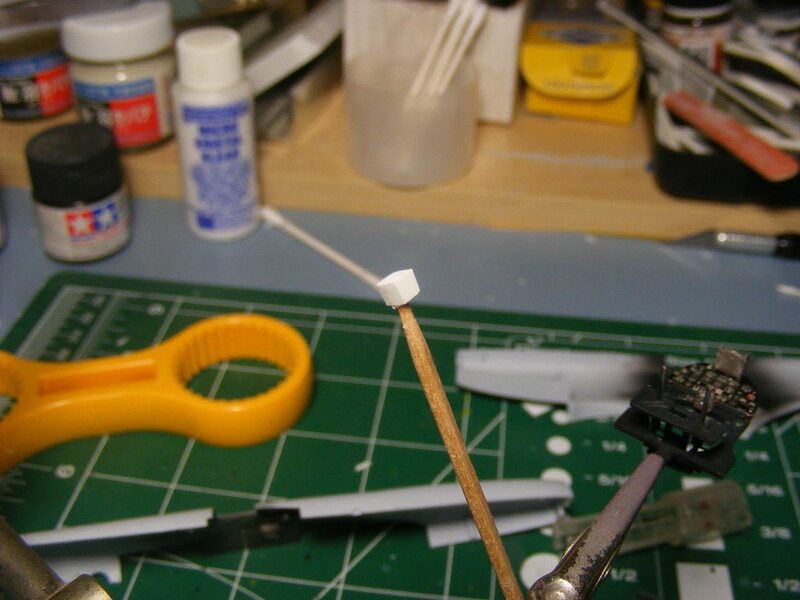 The round stock was stuck on a toothpick and cut and shaped for the headrest. A handy hole in the middle meant I could use thinner stock for a handle when putting it in place and then just be snipped off and sanded smooth. 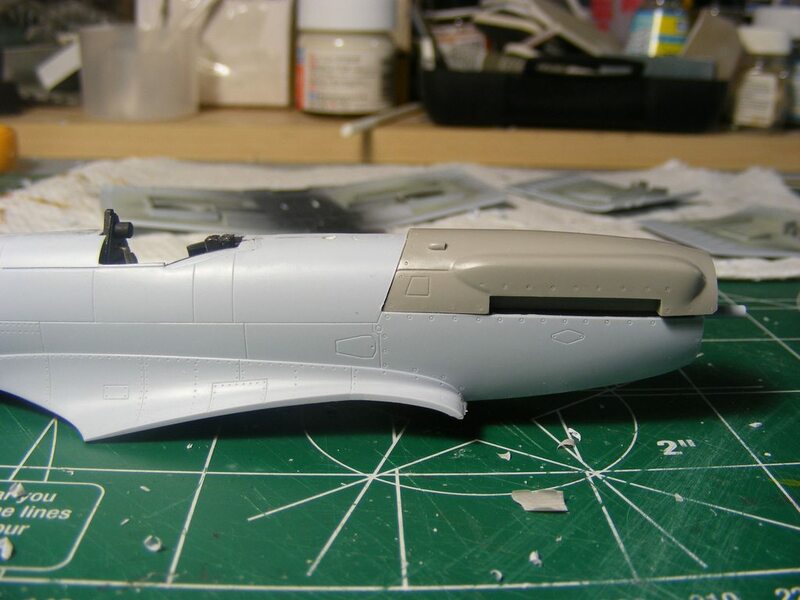 Now I think I can start detail painting the interior. 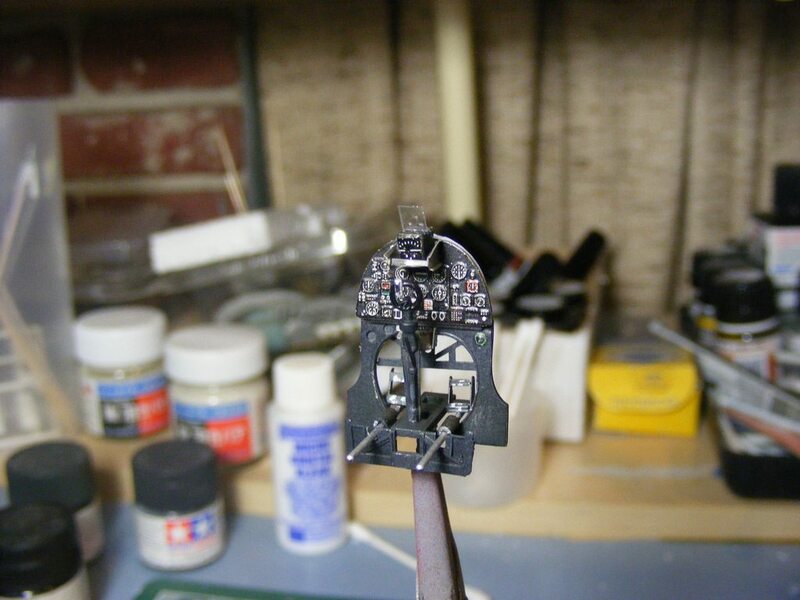 m'kay, so I'm calling the cockpit just about done. 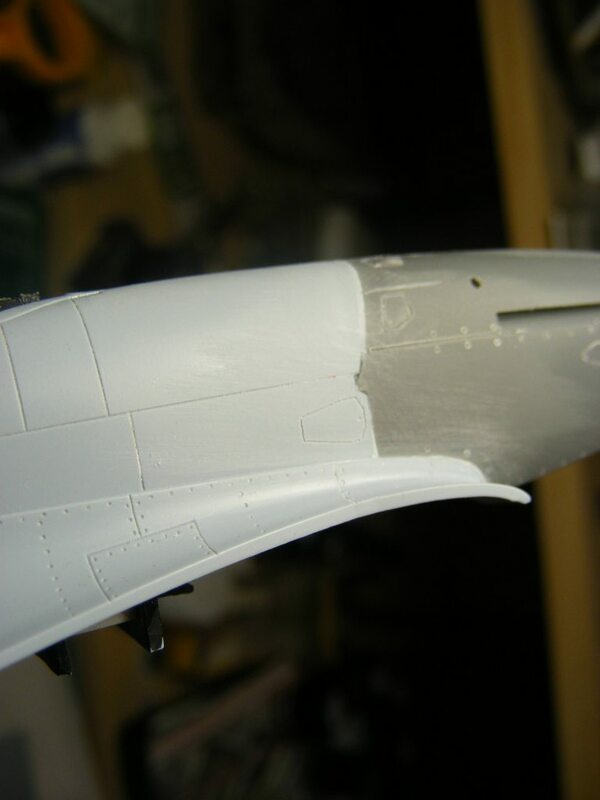 All the paint and PE are in place, as well as a little wear on the surfaces. It may not be exact, but it does look busy. 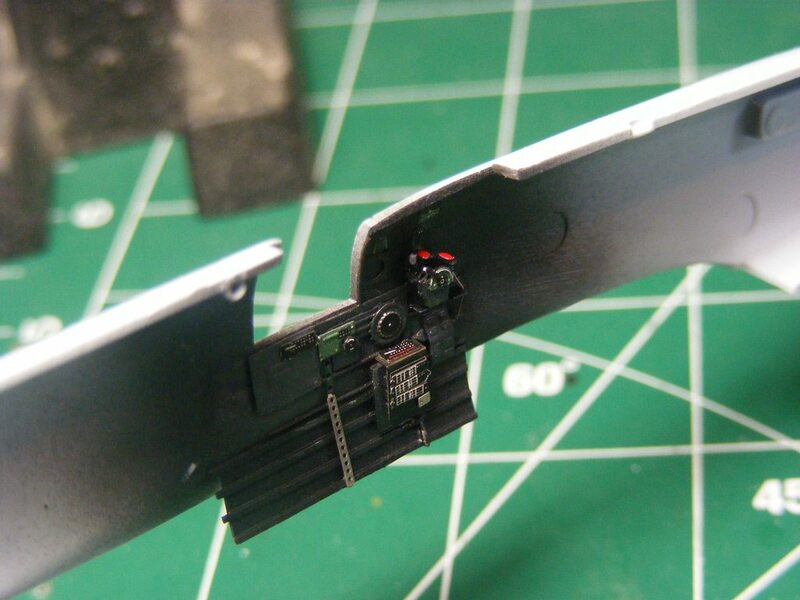 I had to remake the part for the heads up display, as the one from the kit was too small for the PE parts. 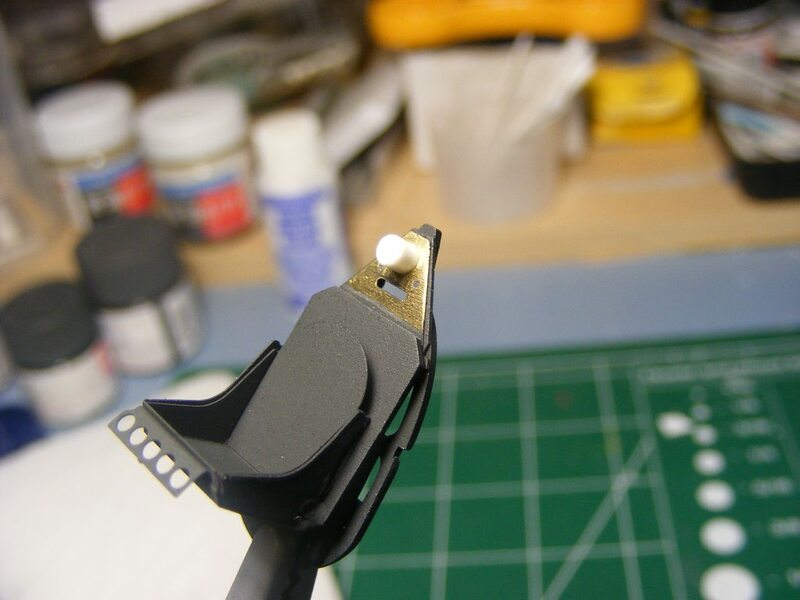 I cut it from styrene stock and somewhat squared it up. 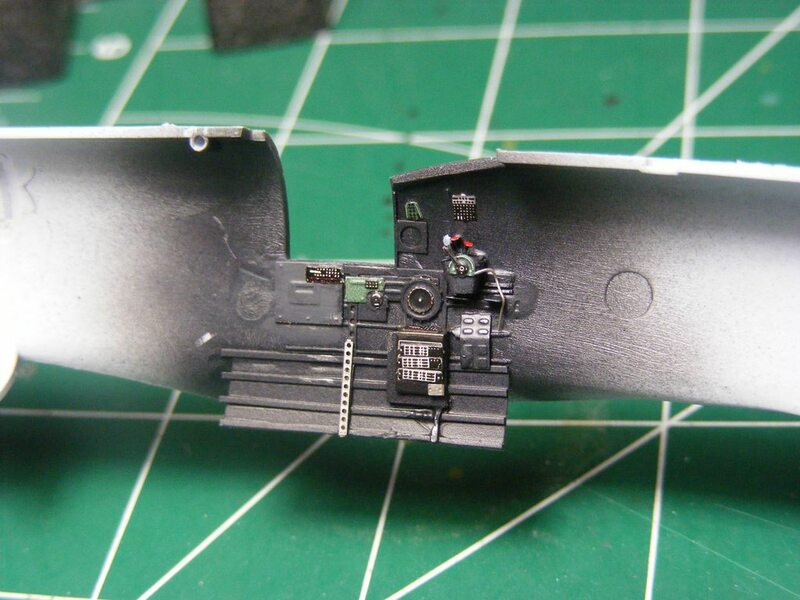 Then added it all together with a lil paint, and a shim of plastic for the HUD glass. 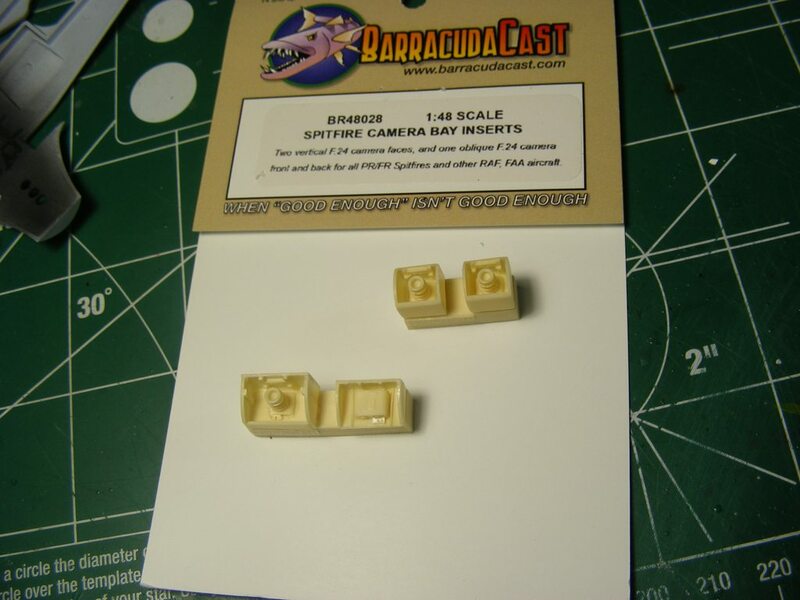 With that done, its onto the cameras which come from BarracudaCast by way of Ultracast from Canada. 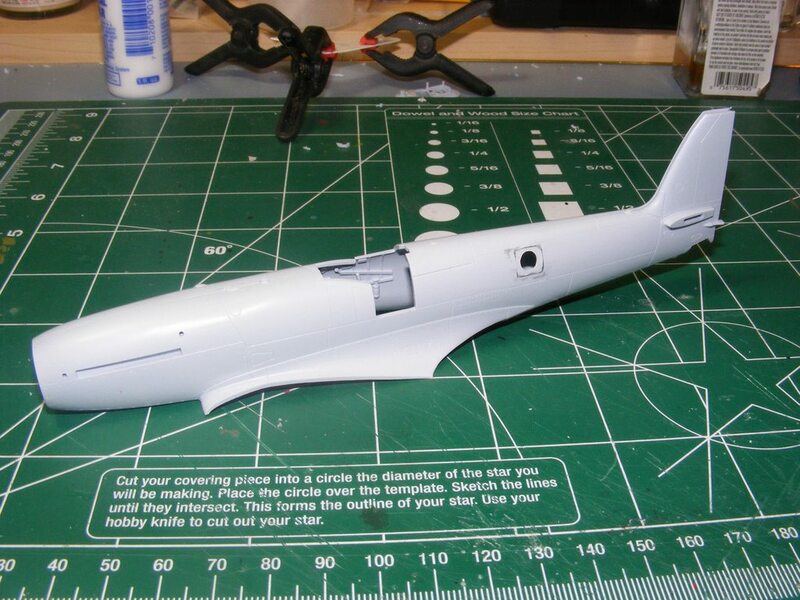 Should be painted up and installed soon, then I can close up the fuselage. Last edited by Tiberious; 06-19-2018 at 08:07 AM. Holy crap, that is fantastic! 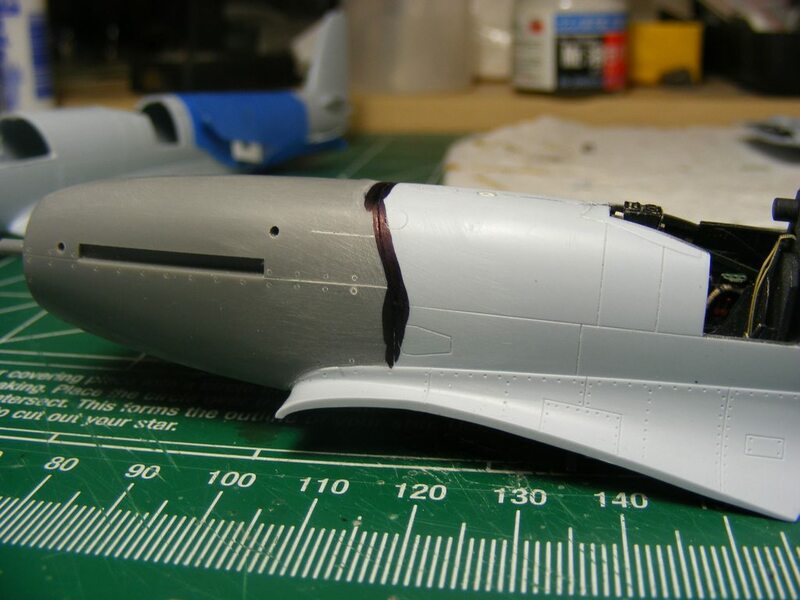 I feel like I can actually fly this model using those gauges. Following this one with interest! 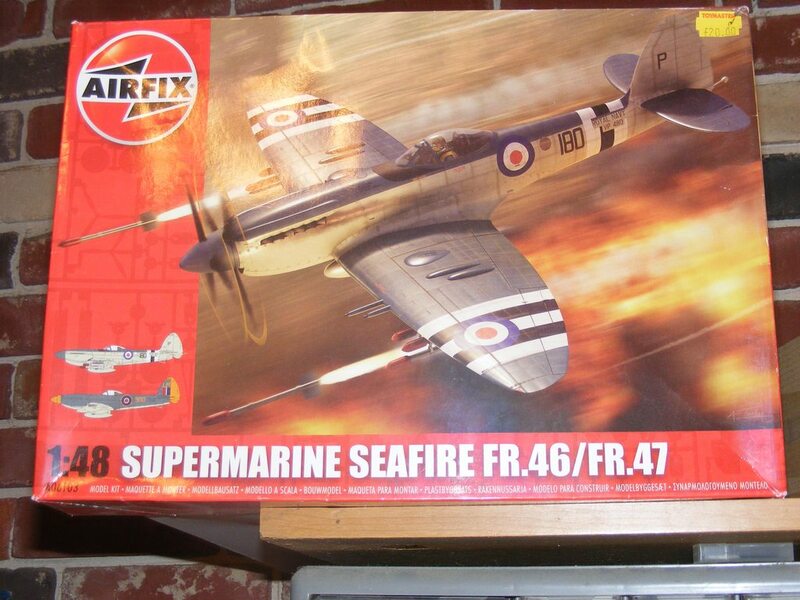 Is there any more graceful shape in the air than the Spitfire and it's variants??? I love PE! Far better than I can do! 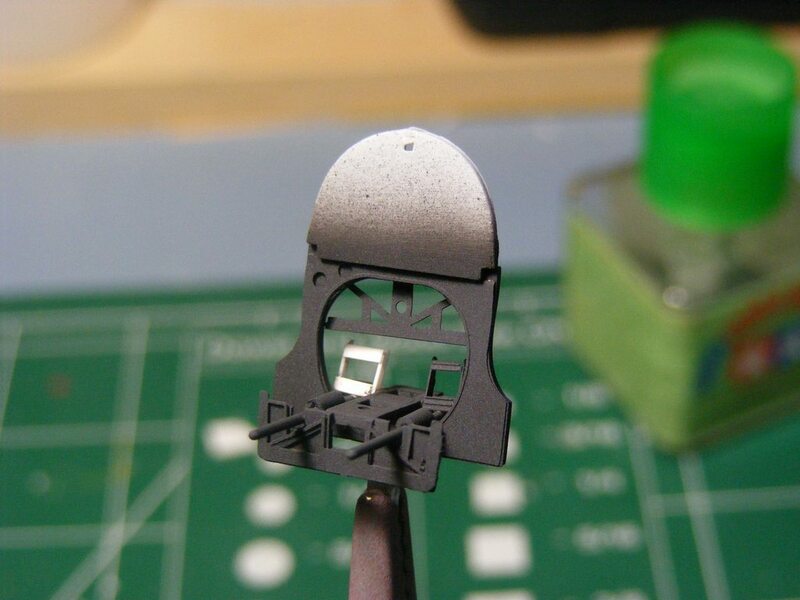 And I think the FR.47 is the best looking 'fire of the line! Love them contra props! 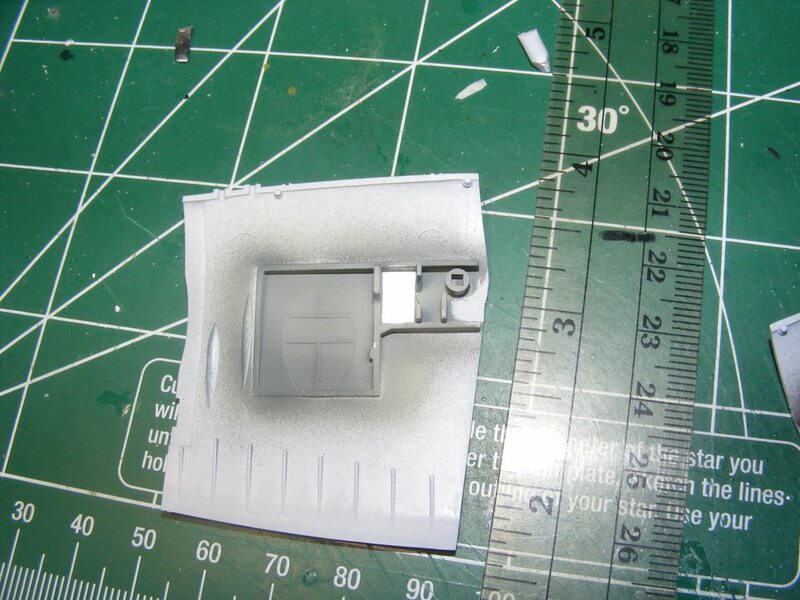 There are two of them, one at the edge and easy to sand out and one in the middle that I covered over with a rectangle of thin styrene. I would rather a thin straight line than a faint circle. As for now, all is drying peacefully and it's time for dinner!! Last edited by Tiberious; 06-21-2018 at 03:35 PM. 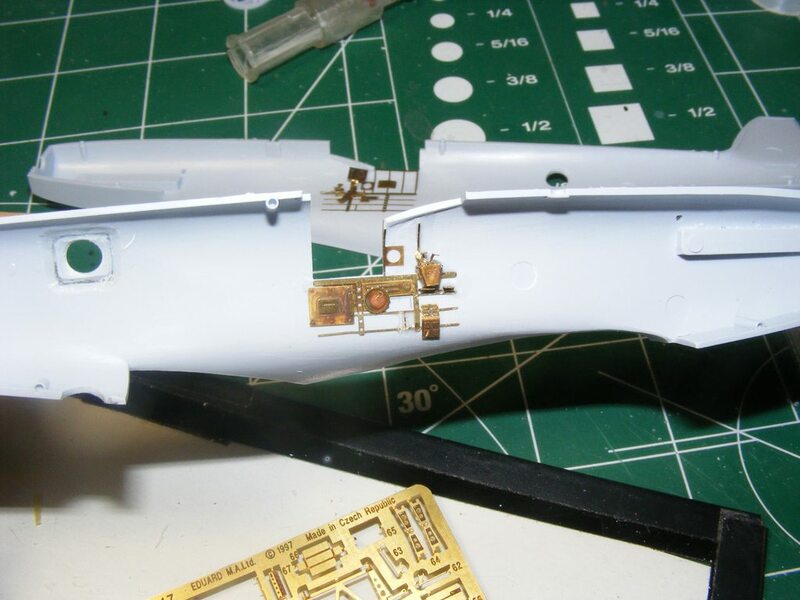 After a moment to think I decided to take the lower peice of the unused part from the other kit, switching it from one side to the other. 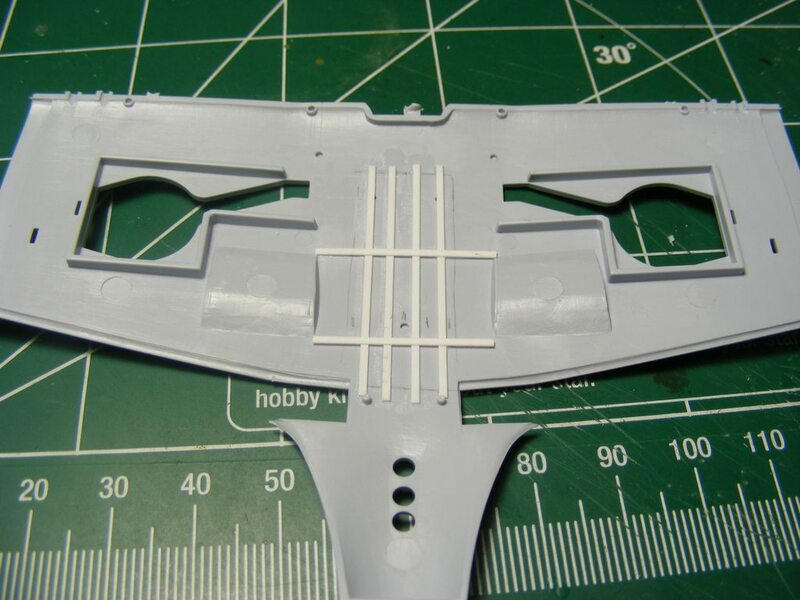 The fasteners would be slightly out of position, but it would still look good. I was good to go, taping it and clamping the piece on for the night to dry. Then lo and behold, the morn came and there was such an unsightly crease in the piece left from the clamp... Imagine the wails of grief. Thus comes the first bad mistake. 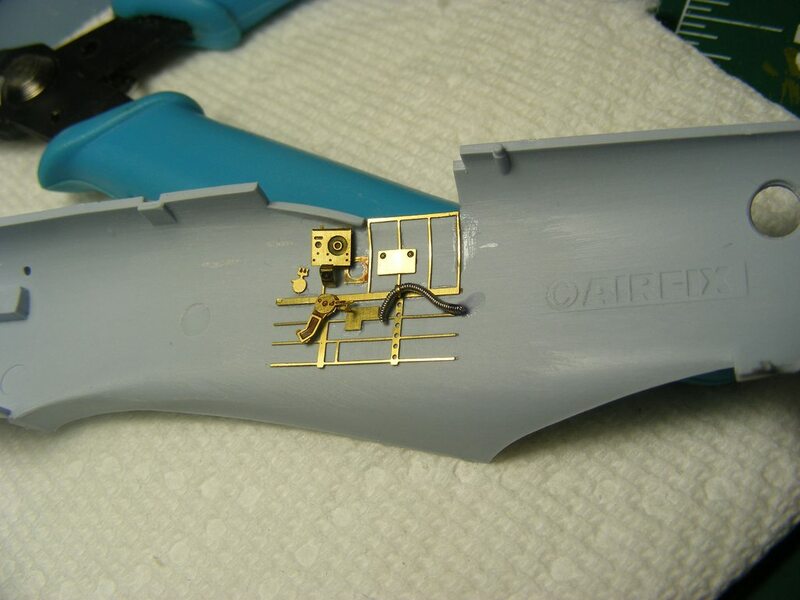 Instead of just fixing the part in situ, genius here decided to pull it off and replace it with the unused part from the other kit. Smart right? NO! I had just used that part to fix the other short shot rocker cover! That and the part was now and truly shot... Time to retreat to my fallback position. 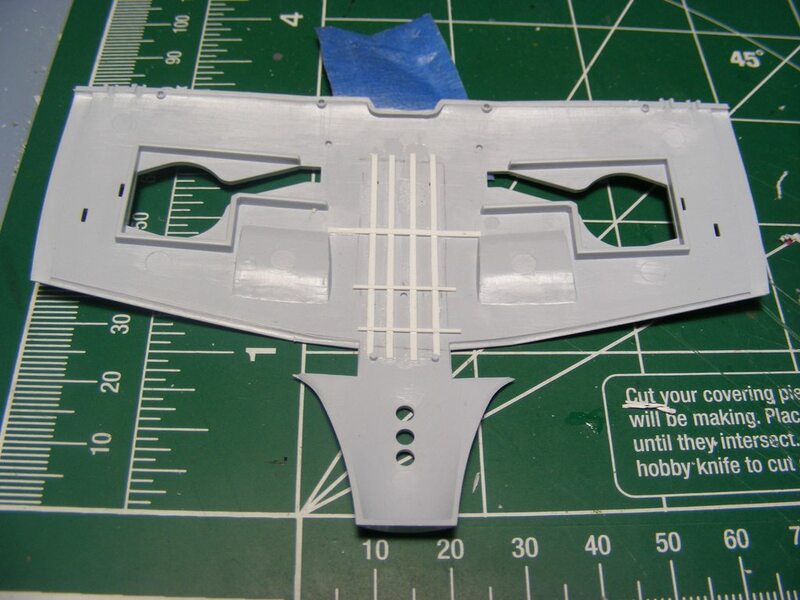 I had been hemming and hawing about using the Quickboost resin cowl that would eliminate the seam line as well as the need to putty and sand the join with the rocker covers. It looks good though. Too bad I can't use it. 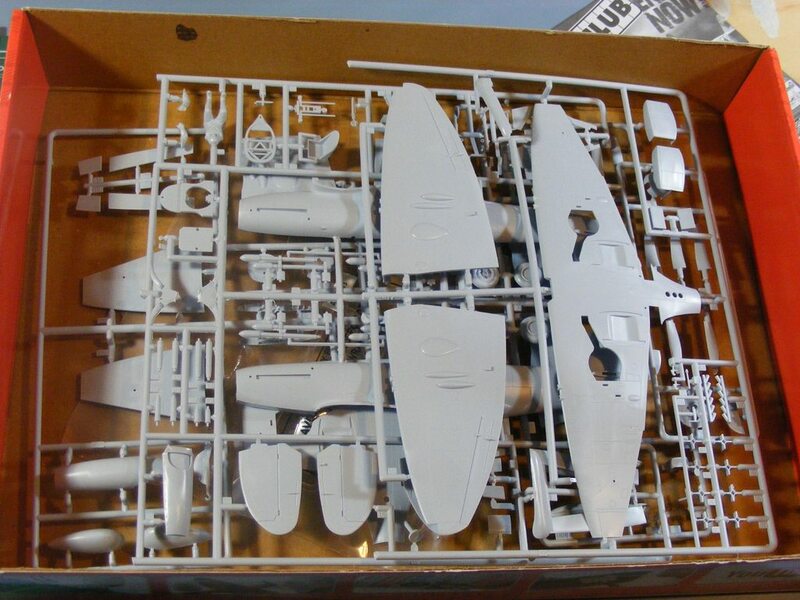 I just happen to have ordered a third kit, this time from the older molding and box art, with the decals for the bird with a red nose cone. That's why I bought it, for that red nose! But now I need its nose too! It does look good. Maybe a little too proud on one side a little rough along the seam. 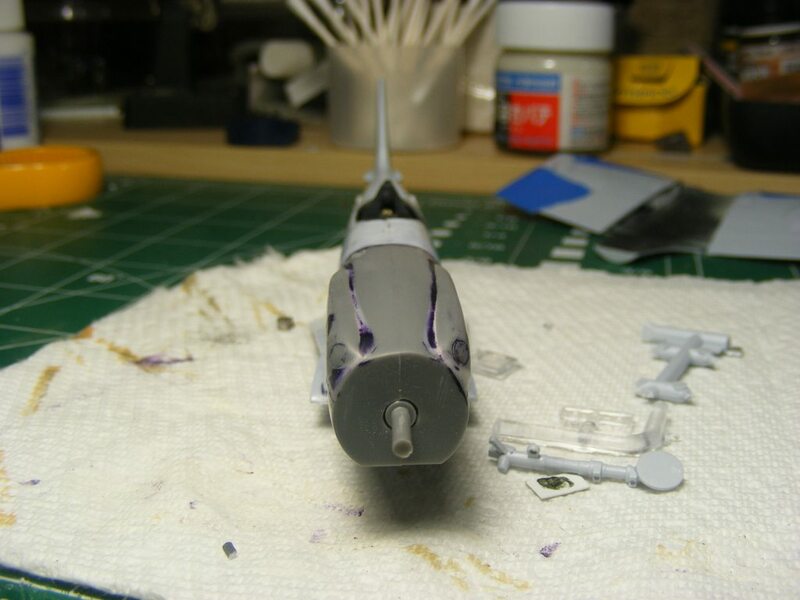 It required sanding, which was also then going to require seam and detail corrections. It was at this point that I realized (actually before as well but I'll stick to realizing afterward) that I really should have just cut off the cowl from the new kit and replaced the old one. It would have been just like the resin drop-in and would have required far less remedial work. 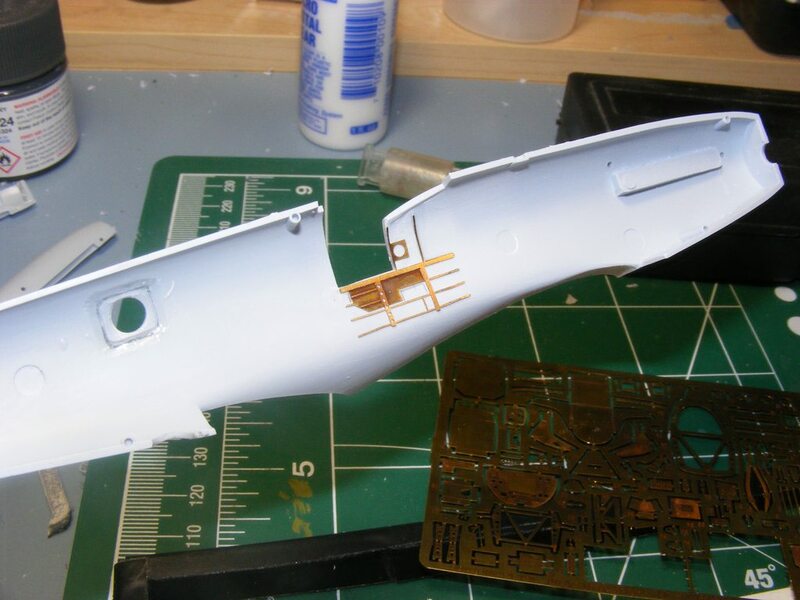 So out came the sanding sticks to even the parts, stopping every so often to run a needle around the hatches and such. 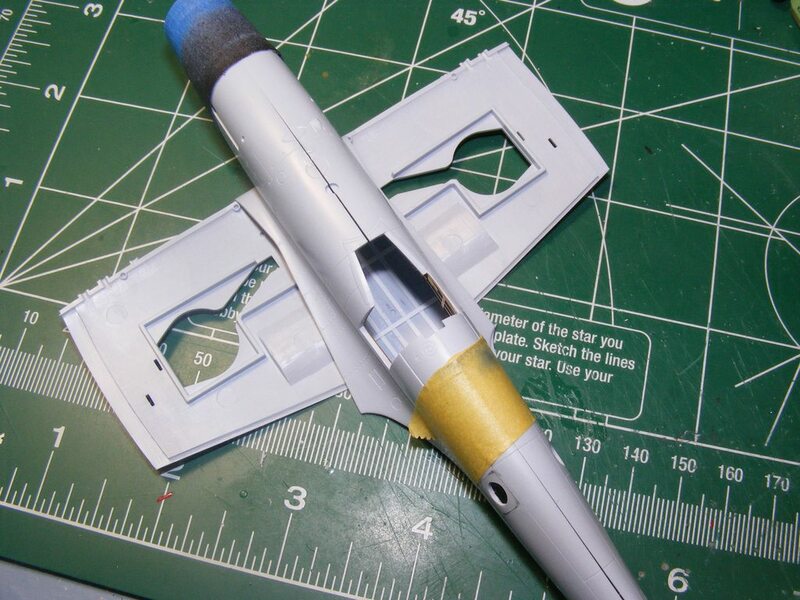 Once the edges were even and smooth, I copied the seam line from yet another kit onto scotch tape and then used dymo and a needle to replace the ones sanded off this kit. 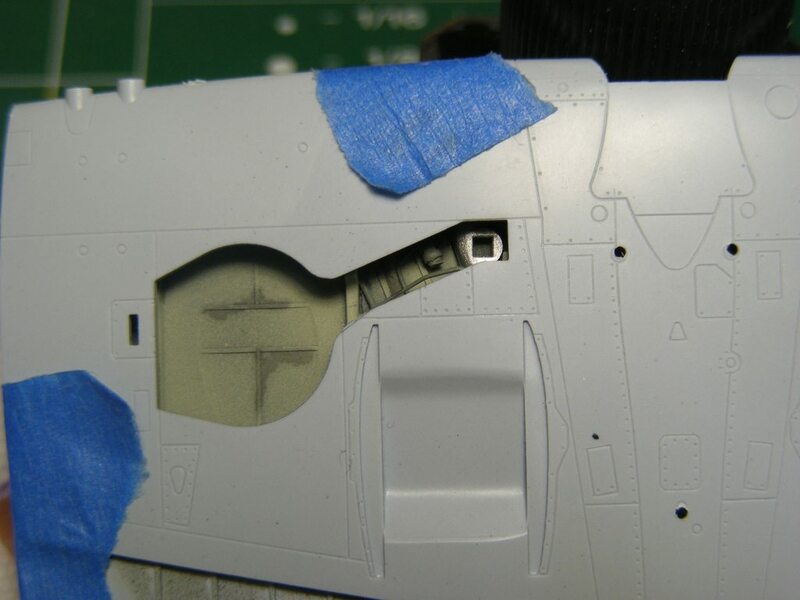 A touch of black marker lets me see that it's looking good, but as you can see those fasteners are suffering. Which means I need a tool to replace them. 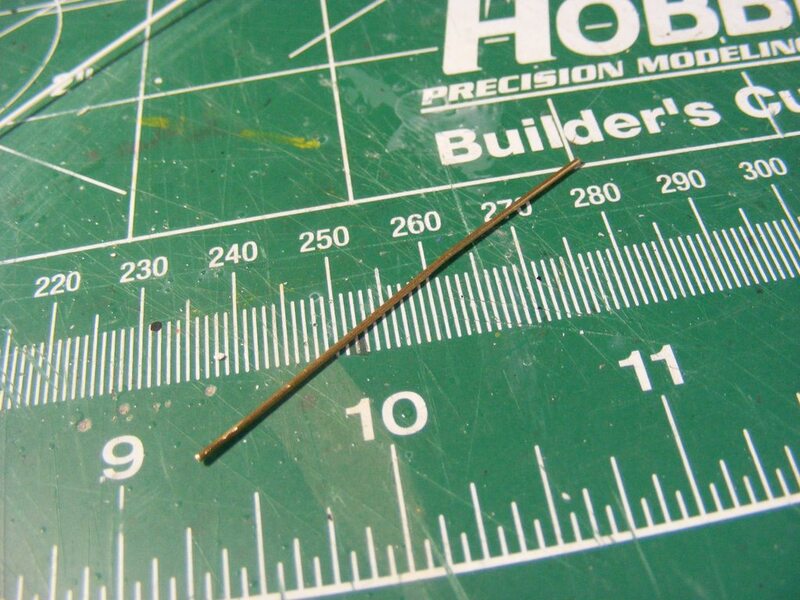 A fellow modeller on Britmodeller suggested a beading tool. As I don't have one of those, I decided to see if I could make my own. So out came the metal round stock pile. At the bottom of which I found this. 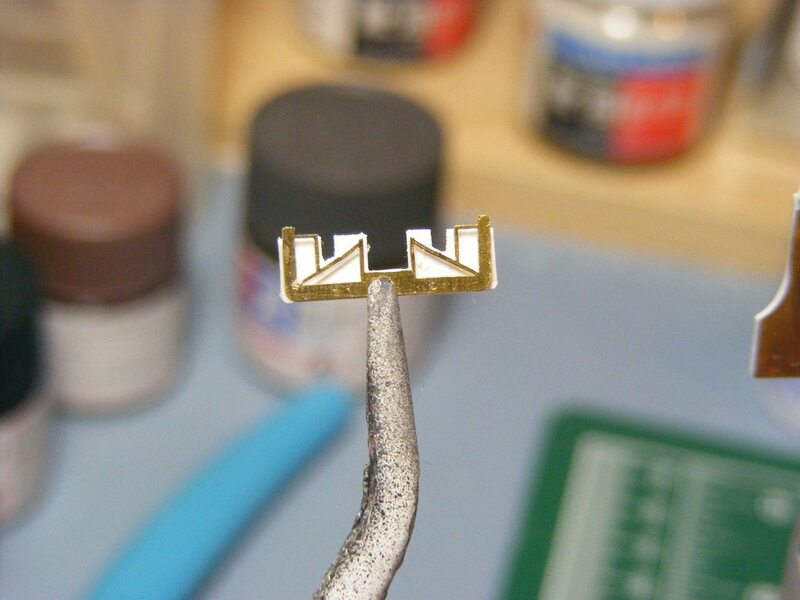 I ran the edge along a dremel sanding drum, cut a piece off and slipped that into a hand to get this. A test fit against a now bad part showed it would work. 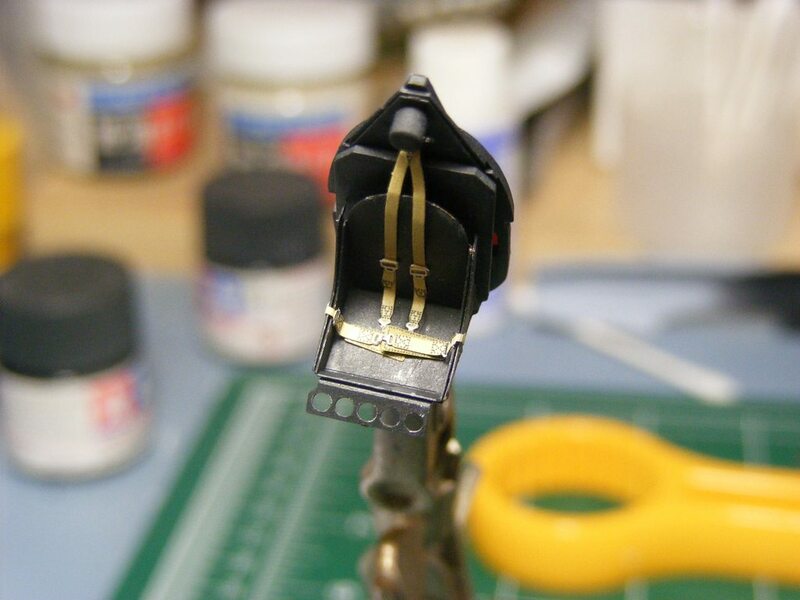 The 'fastener' might be a little larger than the kit detail, but I can live with it! 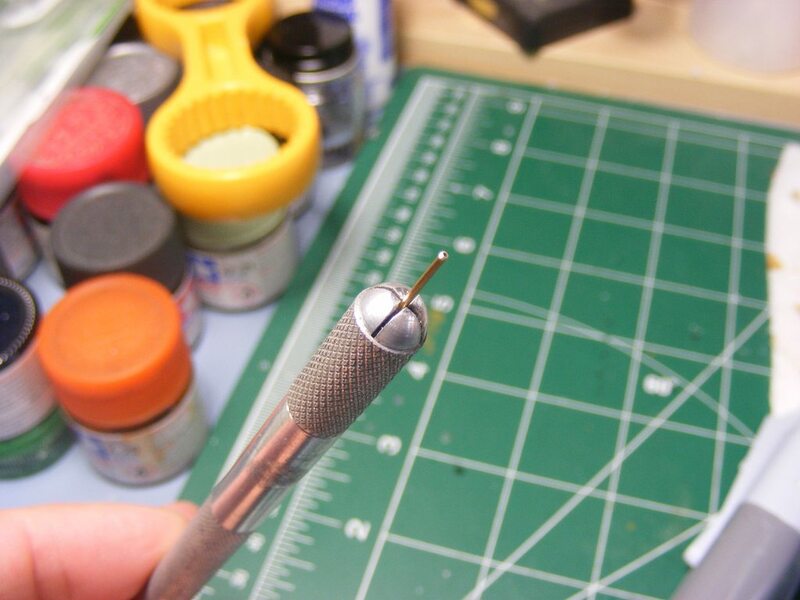 This is a pic where the tool has been used. Not too bad. I went back and redid most of those, learning as I go. In the end I'm fine with it. Not ecstatic, but good. It was time to move on. Whew! 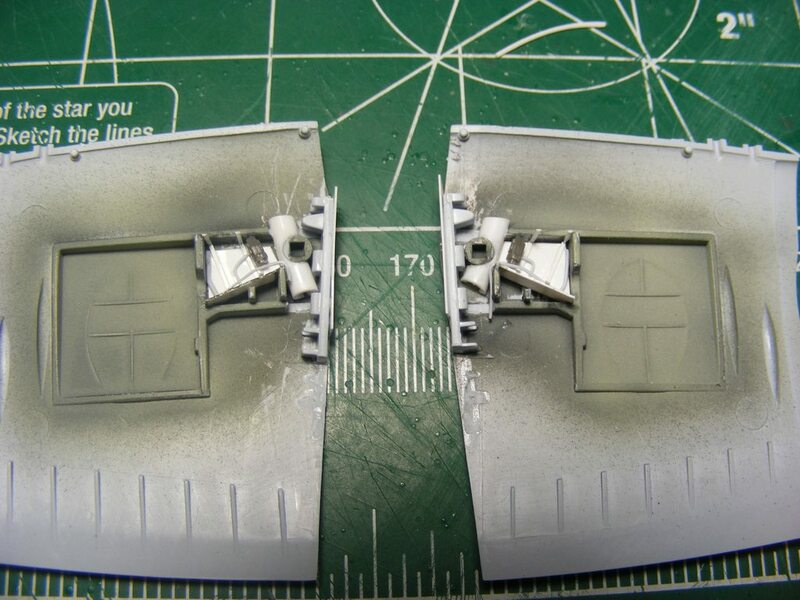 Being back on track, I redid the rocker covers, cutting them back to better copy the real look. 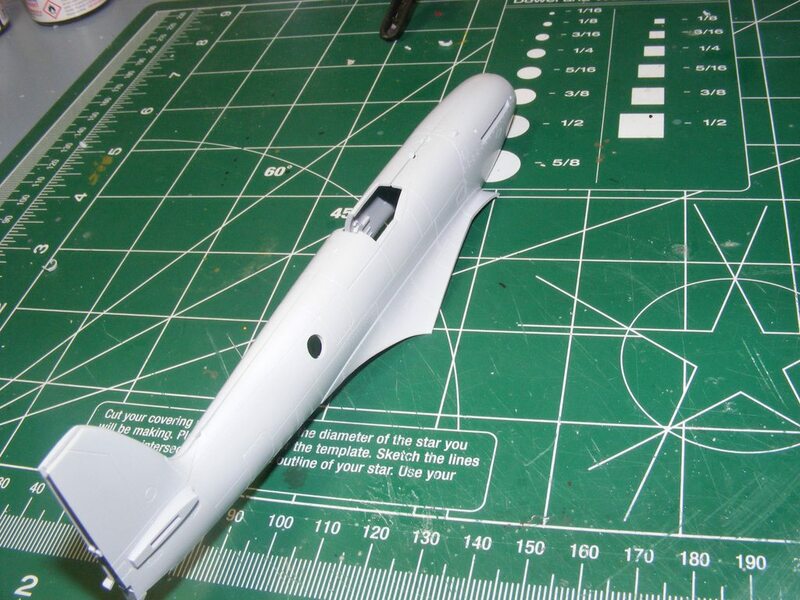 The kit parts extend too far across the nose. 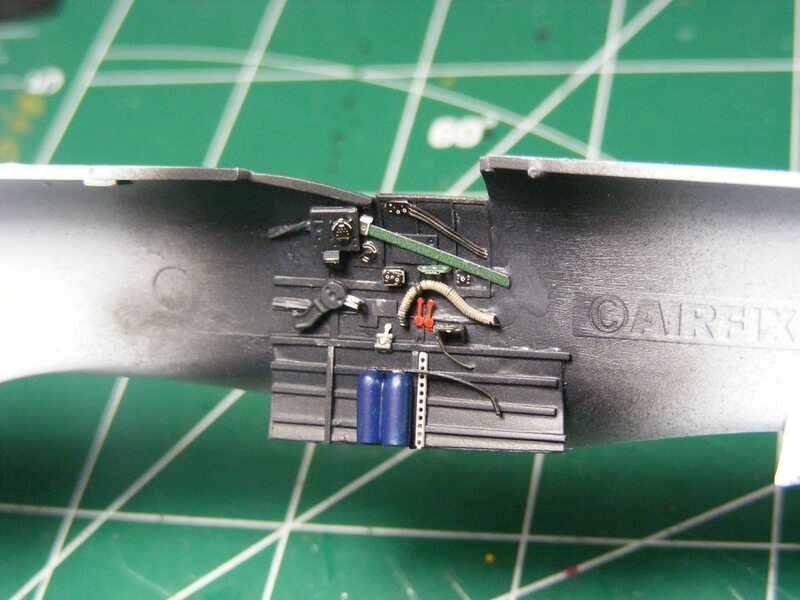 Those were glued onto the cowl and then taped down. And as they were drying, I went back to the wheel wells. 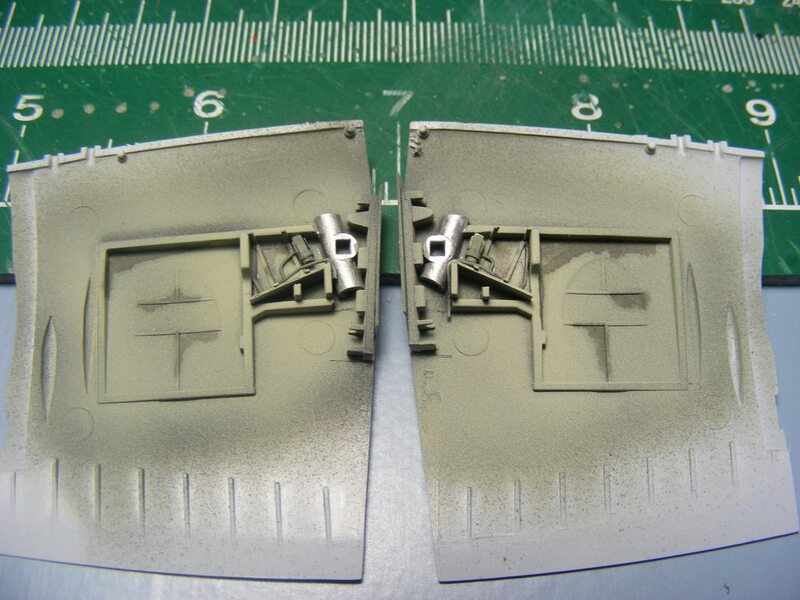 In my internet searching, I found some better pics of the wheel wells and the kits are not that good on mimicking those. 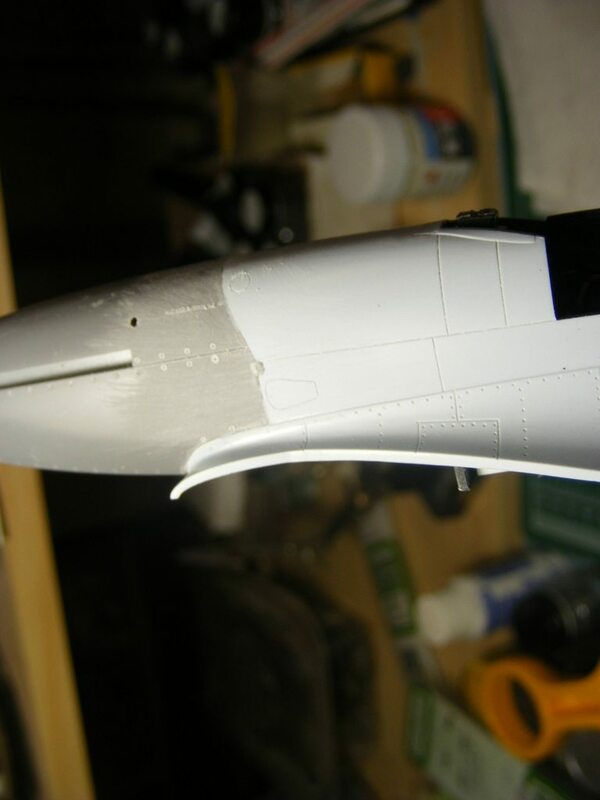 Out came some styrene and round stock and some clippers to remove the imaginary bulkheads. A new wall was made diagonally from the gear seat to the well. 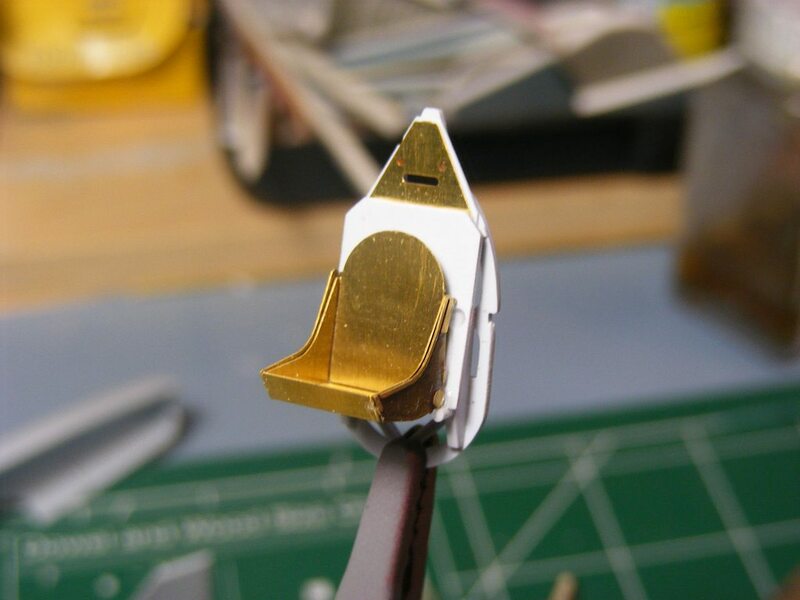 Round stock was notched to fit around where the gear leg sits into the the kit's gear seat. 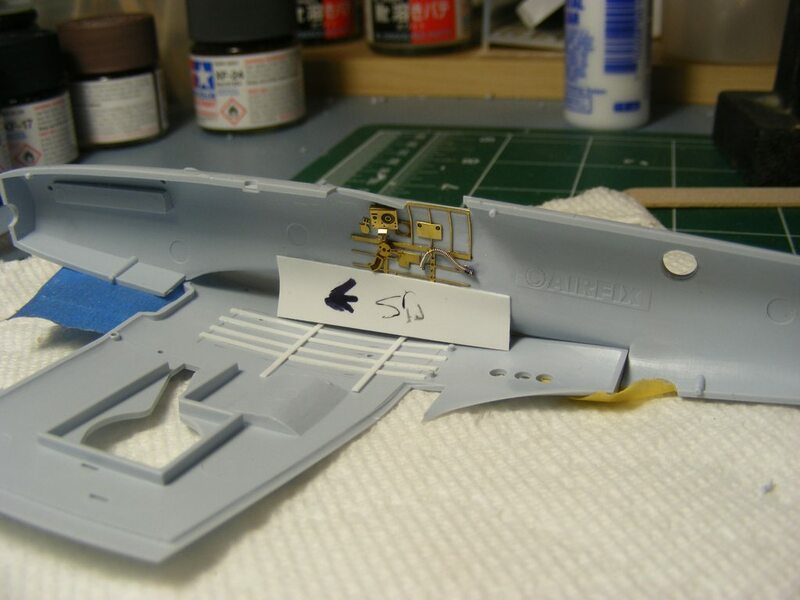 Then thin styrene was used to recreate the ribs along the roof of the gear wells, stretched spru was used for hoses and a misc part for part of the gear retraction system. 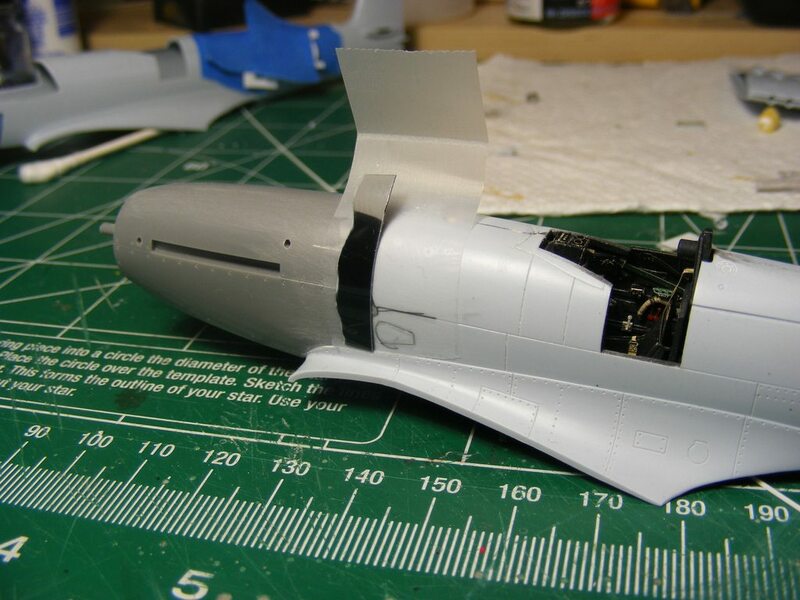 Since the wings will be fully extended, I was able to use the wing fold bulkheads as more detail inside the wing and as a light block should it be needed. 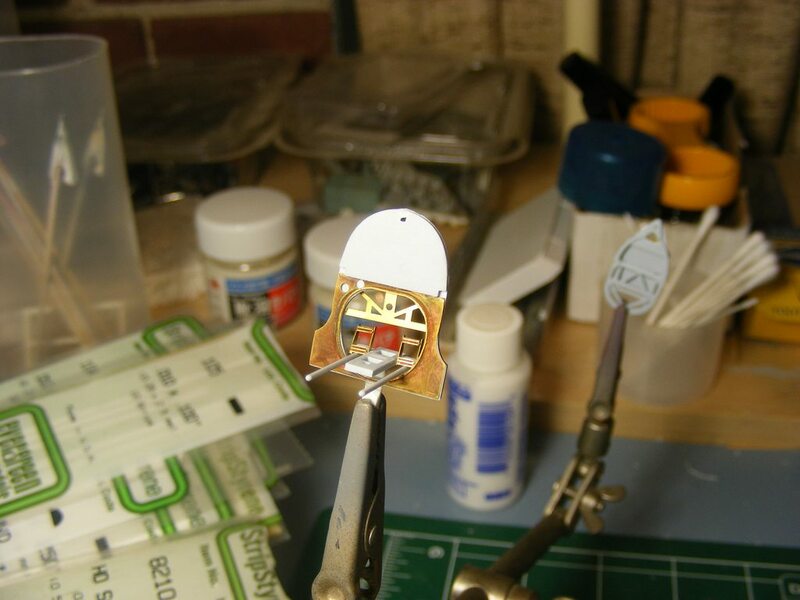 These were then hit with black and then sky, silver for the rotating cylinder that the gear rotates on and some light touched of panel line wash for stains. 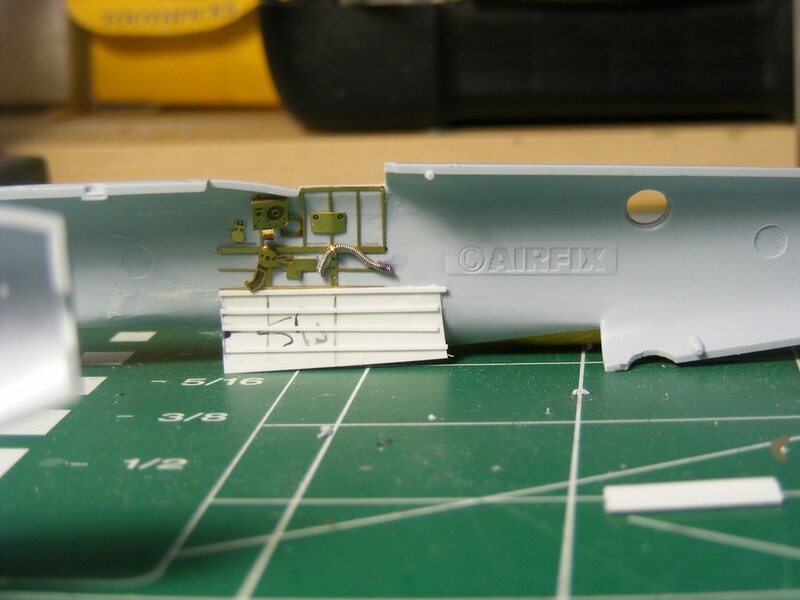 Some last pics to see where the fuselage is. 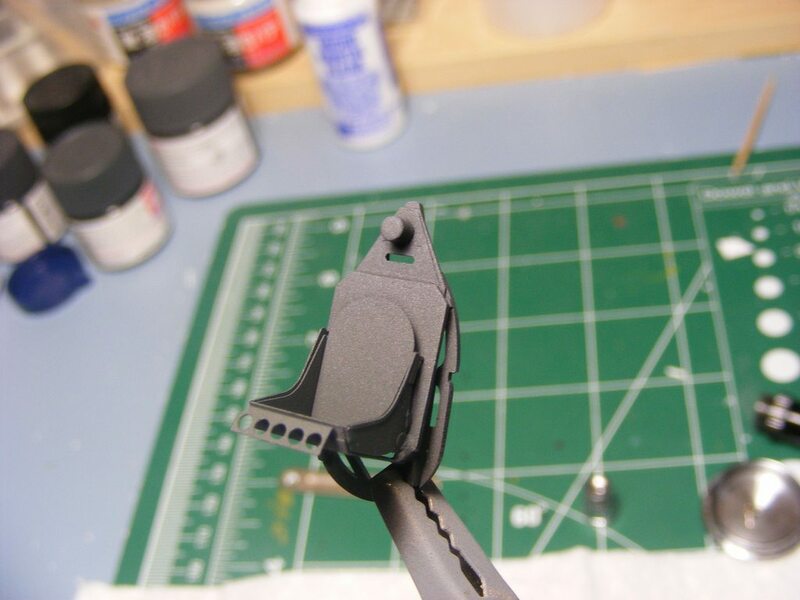 The black marker makes it look odd, but it's easier than painting to see if there is still some sanding to be done. Still some touch ups needed, but it's getting there. 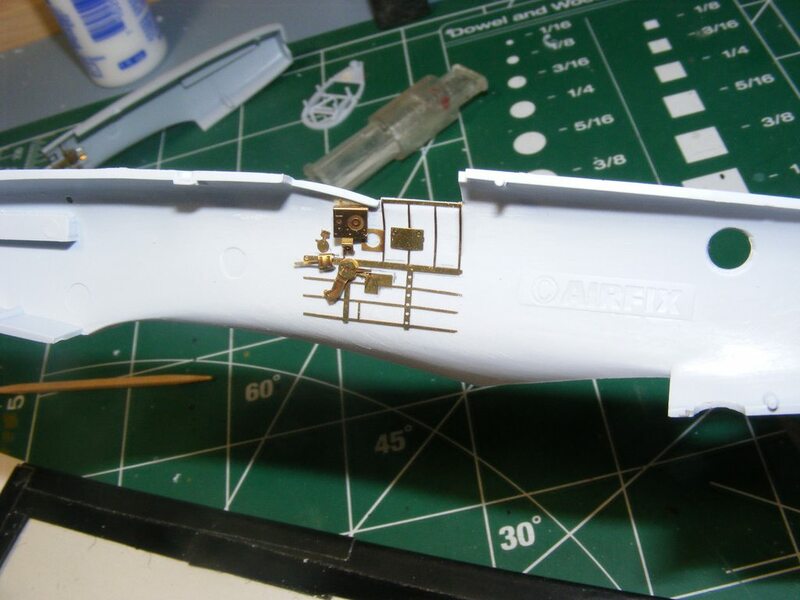 And man do I wish that resin part had fit! It's too much work getting those rocker covers smoothed in! Enough for now, good night! 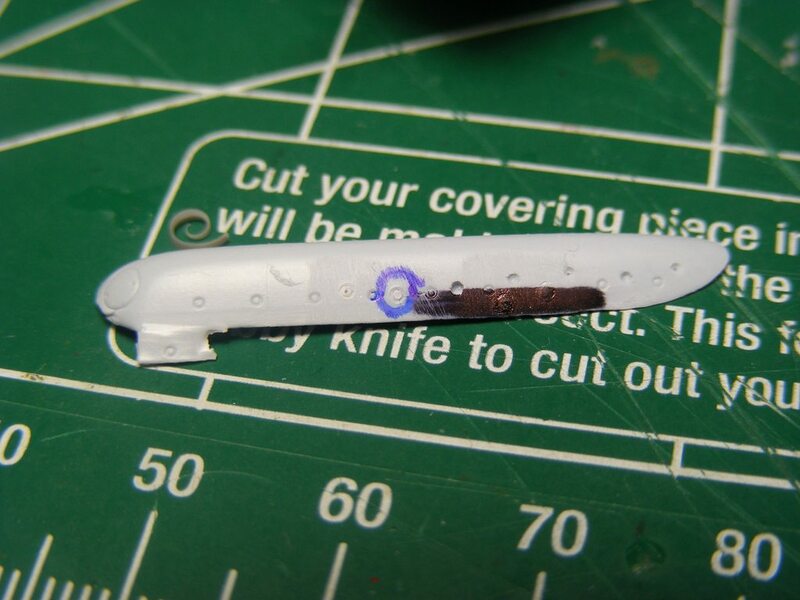 Does the black marker interfere with the subsequent primer coat (poor adhesion, etc)? On a side note: as recently as five years ago, I wouldn't have even clicked on a post like this, but ResIlluminati posts are usually so detailed, most any subject is worth reading. 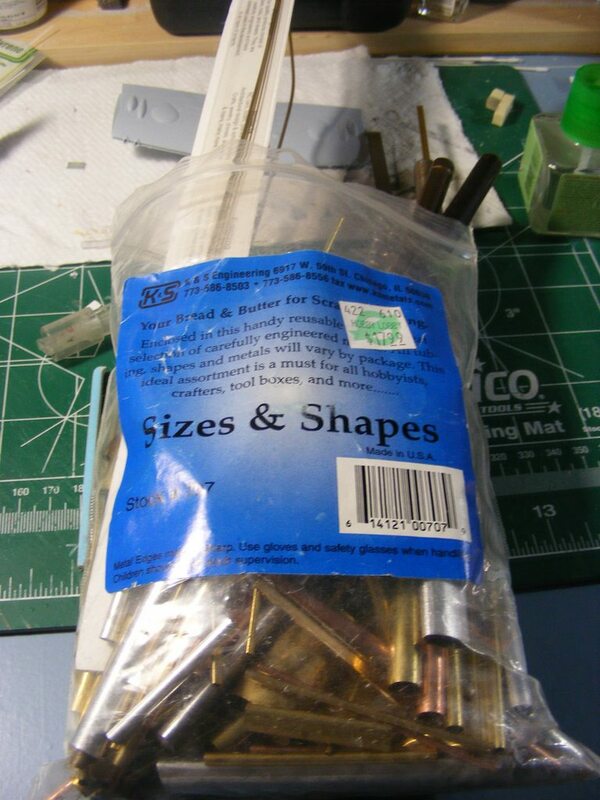 Tiberious's post is so intricately explained, I can see how to use these techniques on my current project -- and it isn't a plane kit. No idear. 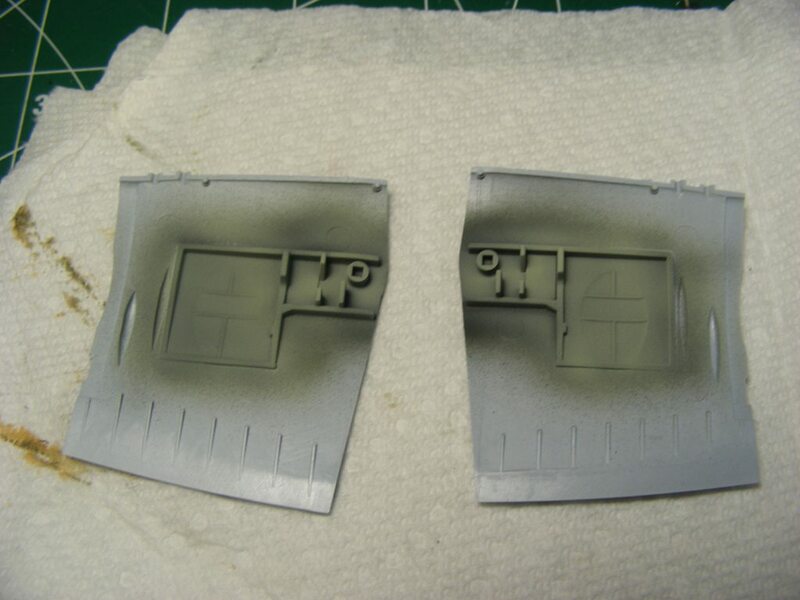 Those areas are being lightly sanded, so a lot is coming off and there will be a primer coat. We'll see after the paint dries! Glad to hear! I usually think I'm just mucking along. What is the current project? I have seen room walls where a sharpie or vivid marker had been used prior to painting. It does 'seep' through acrylic paint. No idea about enamel.